What’s even more important, though: More and more people are commenting on my stuff and providing me with food for thought and additional ideas. And of course, this serves as a constant encouragement to step up my game. So here’s a very heartfelt thank you to all the readers, followers and commenters, both here and on my various threads on the forums! Getting feedback from you guys or just seeing that anybody reads this stuff at all has helped me pull through more than one motivational slump! 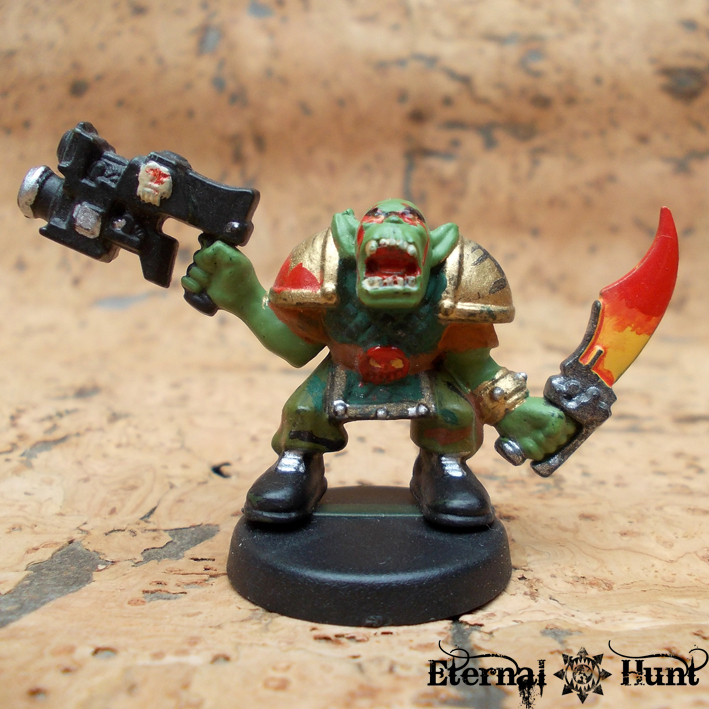 And getting to talk to talented hobbyists like Biohazard, PDH, Ron Saikowski, Commissar Molotov, the Spiky Rat Pack, HOTPanda, DexterKong, Mordian7th and many more by way of this blog and my forum activities has been a real blast and maybe the best blogging experience of all, so thanks to you guys as well! 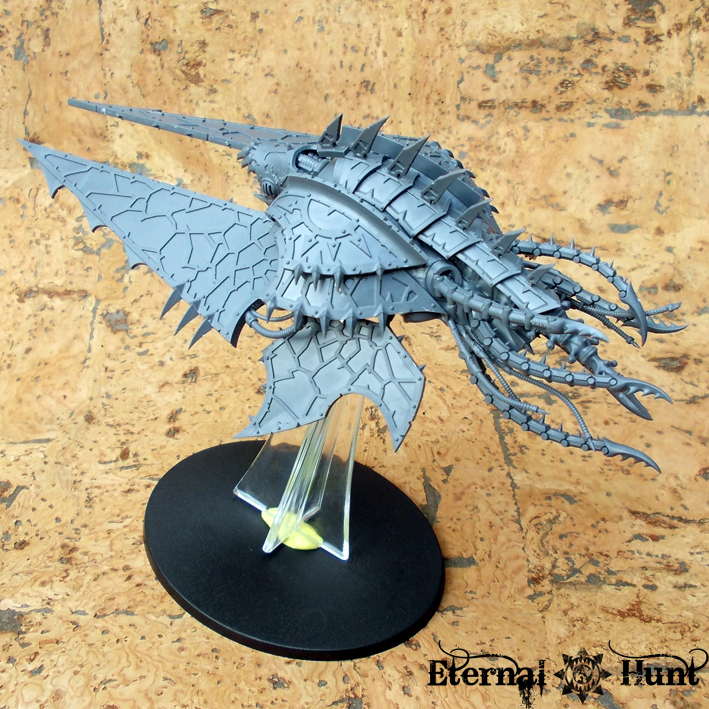 Oh, and while updating this blog and trawling the other blogs and forums is sometimes quite a bit of work, I still managed to paint about 90 models since starting the blog – among them some bigger projects like my first tank ever or my converted Heldrake – and kitbashed and converted quite a few more, so I guess the blogging didn’t actually completely prevent me from doing actual hobby work, after all. Now, before I get all sappy, what better way to celebrate this occasion than to descend into the deepest, darkest dungeons of my personal hobby history and show you something reeeally old? That’s right, my first 40k models ever! Before we do that, though, you have to understand that those were very different times: The Internet, back then, was still mainly the domain of “The Haxorz” and those patient enough to be rooted through to a network of what ultimately amounted to crude excel spreadsheets by way of their actual telephone. 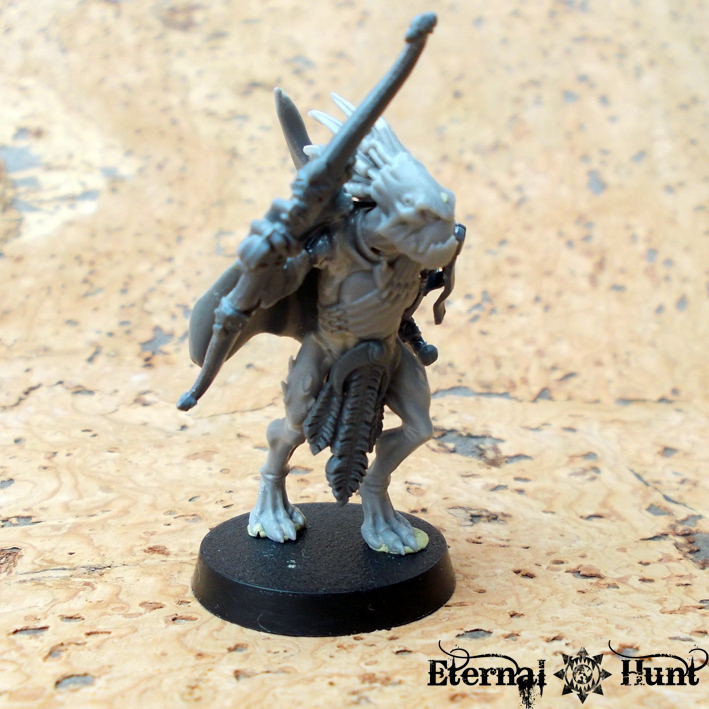 So what I am trying to say here is that there was no way of getting inspiration and help from the forums, and even actual hobby materials were scarce to come by. When my buddy Phil picked up 40k around the 8th or 9th grade, though, us proto-nerds knew he had something special on his hands. 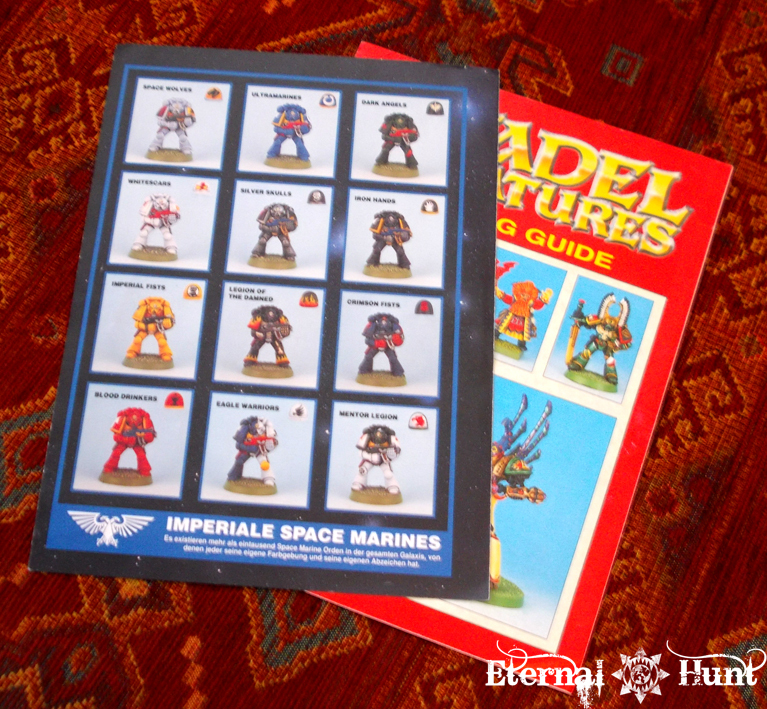 And I immediately recognised the resemblance of his 2nd edition starter box minis to those that had come with my treasured box of Space Crusade (which, until then, I had mostly regarded as a dolled-up version of HeroQuest…IN SPACE!). Anyway, I remember the school breaks spent poring over the few precious colour pages in the middle of the 2nd edition rulebook, admiring the fantastic models and great paintjobs (pro tip: Some of them didn’t manage to hold up all that well…). 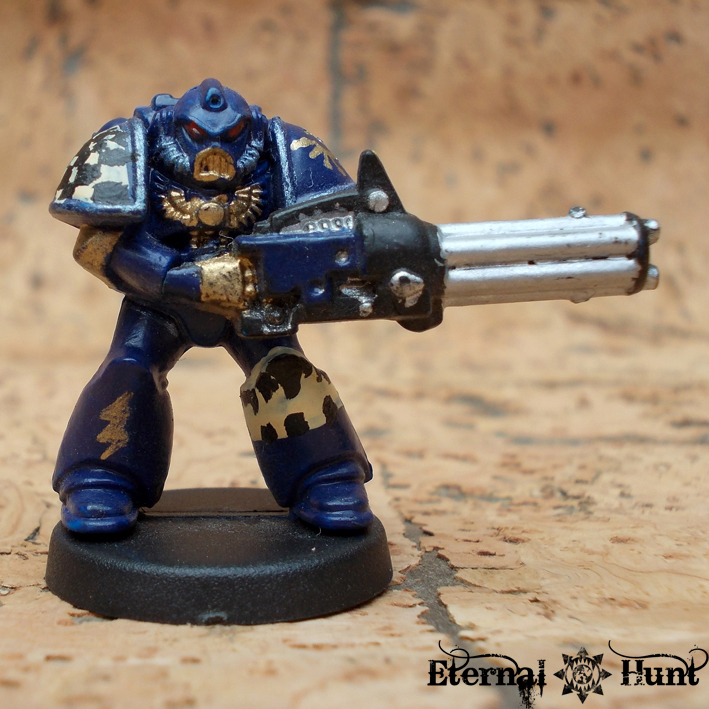 And so, one day, after school, I sat down with the desire to paint my own Space Marines just as well. Now what does this nostalgic and slightly embarrassing tangent tell us? Well, this is where it all started! 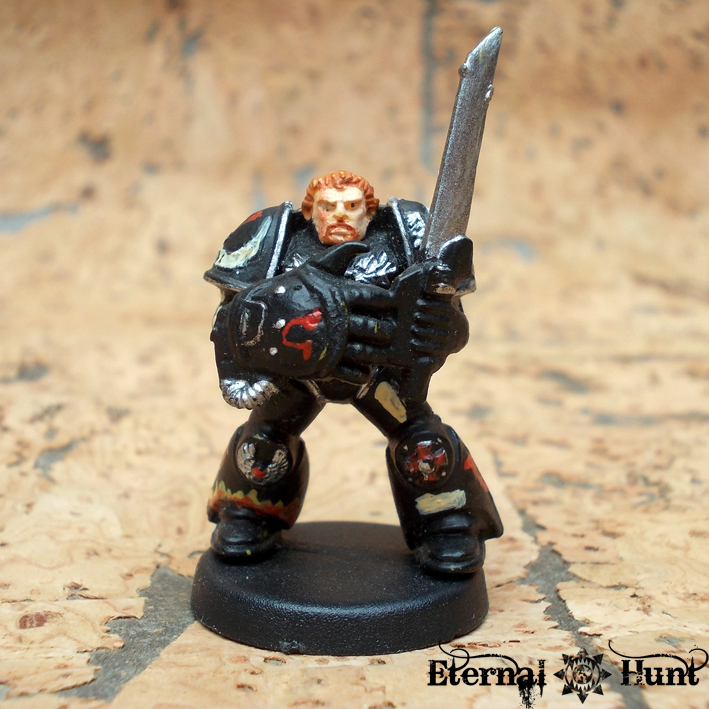 Fast forward roughly twenty years (God, I feel old…) from those first models to me starting my very first wargaming blog, which, in turn, is already one year old today. Huzzah! So where do we go from here? Thanks again to anyone showing interest in this blog! I’ll keep the content coming (although I cannot promise you whether I’ll be able to keep my posting schedule locked at two updates per week forever), and I would love for you all to keep bombarding me with feedback, ideas and criticism! 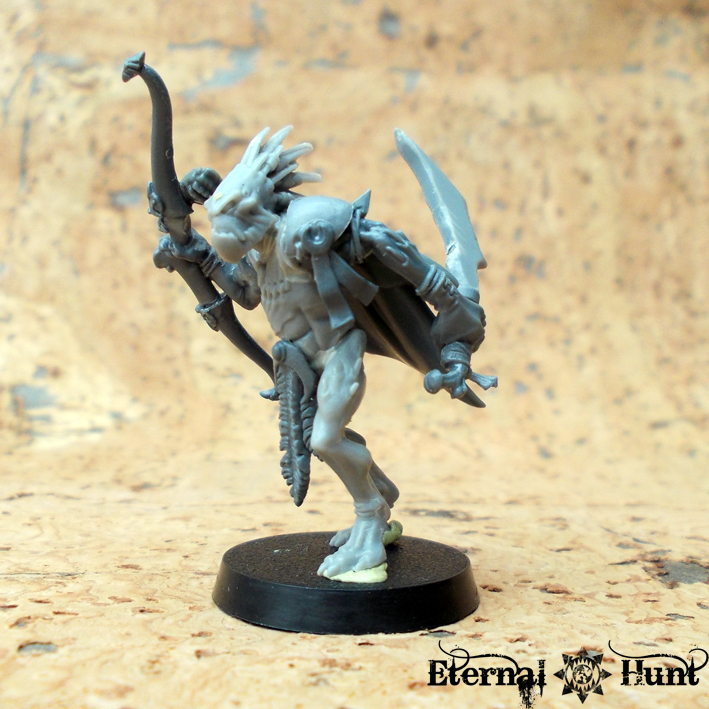 Here’s to Eternal Hunt! And to you people! And, as always, thanks for looking and stay tuned for more! It is very clearly a great time for being an INQ28 aficionado: More and more people are trying their hand at converting their own Inquisitorial retinues, and with John Blanche’s column in WD regularly dedicated to INQ28 models, and with the work of exceptionally talented artists like PDH and migsula indeed being published in WD proper, it seems like a second spring for a game that was pretty much abandoned by GW years ago. 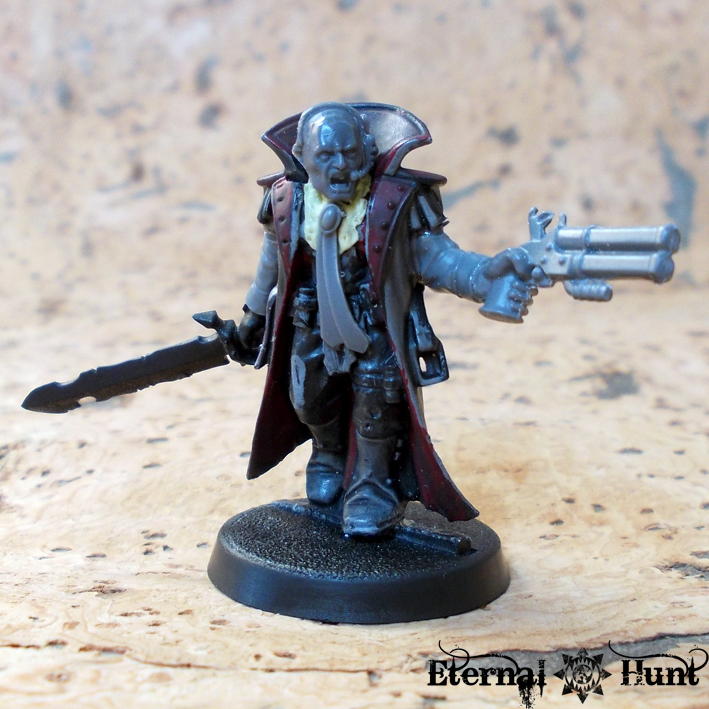 The first few models will end up as retainers to Inquisitor Erasmus Gotthardt, of the Ordo Hereticus. All of these were previously posted in the first INQ28 desktop roundup, yet I have worked on them some more since then, hammering out the last kinks and rough edges, dealing with unfinished stuff and taking to heart the feedback I received on forums. 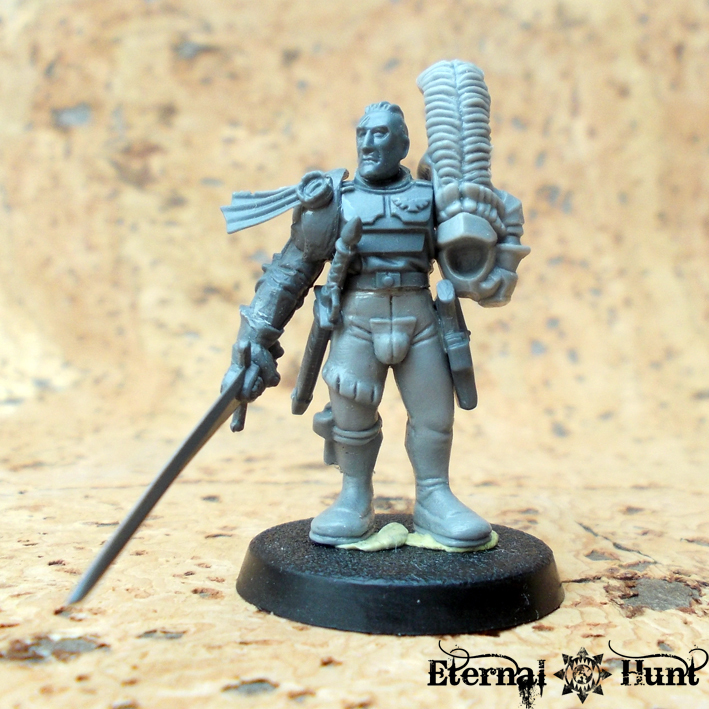 I wanted this guy to look like a tough-as-nails ex-hive-cop who knows every trick in the book and is quite used to walking the beat on the wrong side of the monorail tracks, and the pilot model from the “Battle for Maccrage” boxed set nicely fit the bill. 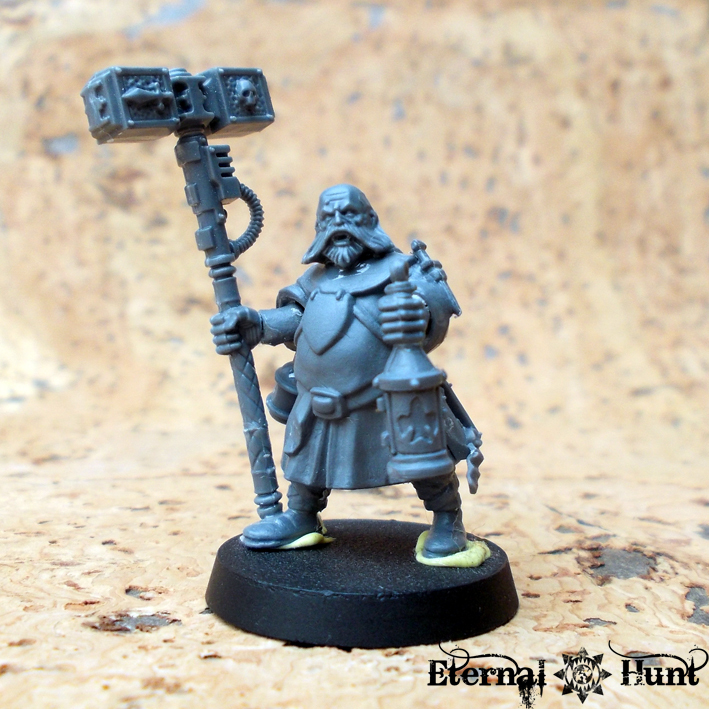 Since we last saw this guy, I replaced the clunky DA power maul with a more fitting stun baton, spliced together from the grip of the aforementioned maul and a WFB Marauder weapon. Again, it’s a small but important change. 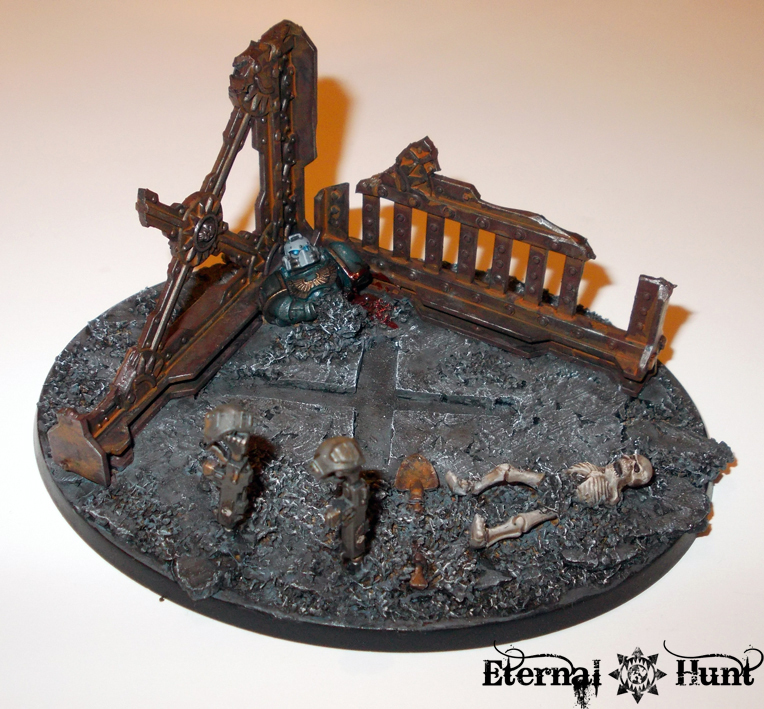 Well, you cannot have a puritan Hereticus warband without one of these. 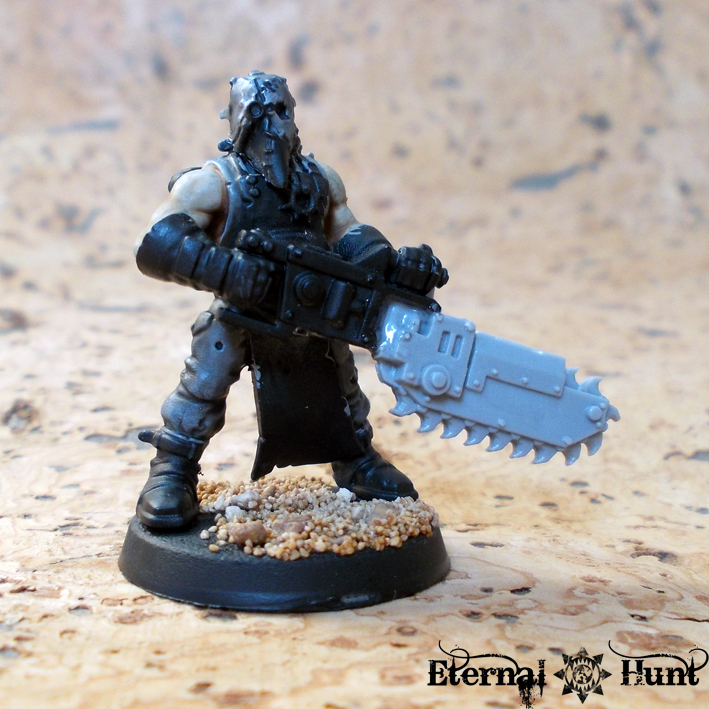 The model is a pretty straightforward kitbash, using parts of the Empire flagellants, a Guard laspistol and a Khorne Berzerker chainsword to make a suitably imposing eviscerator. 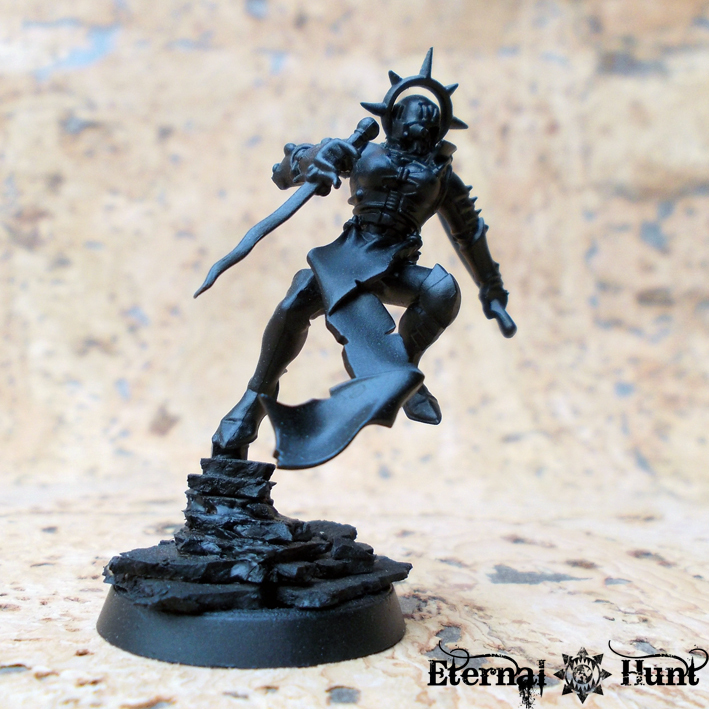 This bonny lass, codenamed “The Dancer” is a (death cult) assassin in the employ of Inquisitor Fiegmund. I have this idea about several members of Fiegmund’s retinue being female, which should be an interesting way of setting off the dark, gothic look. 3.) 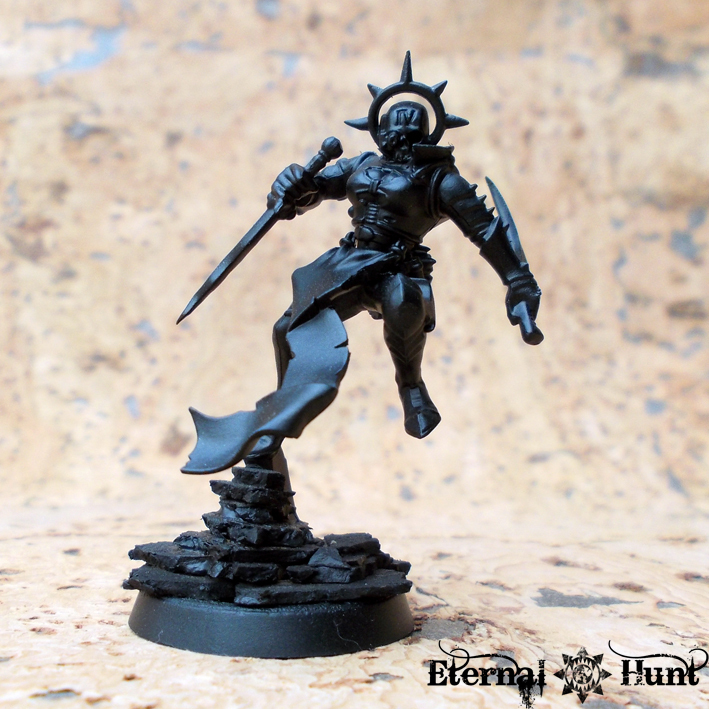 Yet another retinue — Xenos this time? 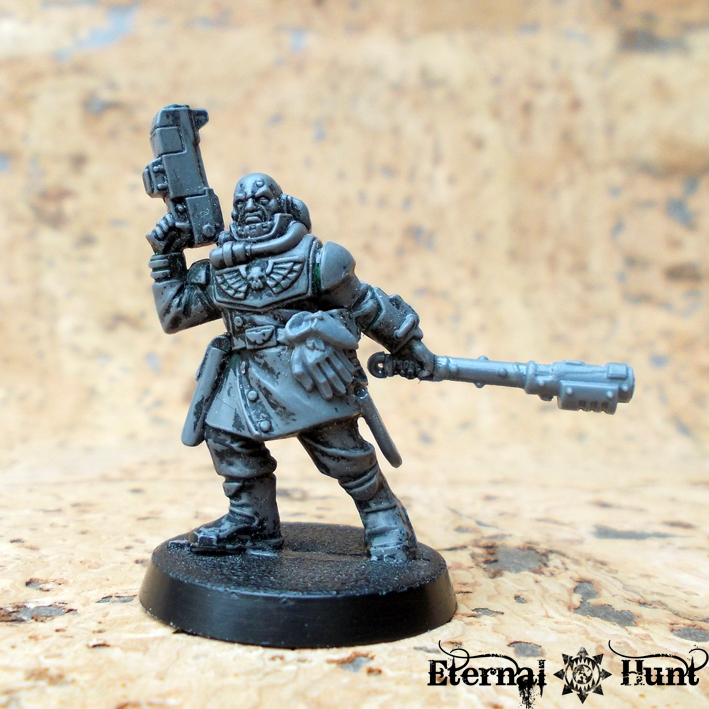 Oh, and by the way: Some of the following conversions were only made possible because my buddy Biohazard was awesome enough to let me have his batch of Dark Vengeance cultists, so I am free to use them for all kinds of INQ28 goodness (and for several other projects as well). 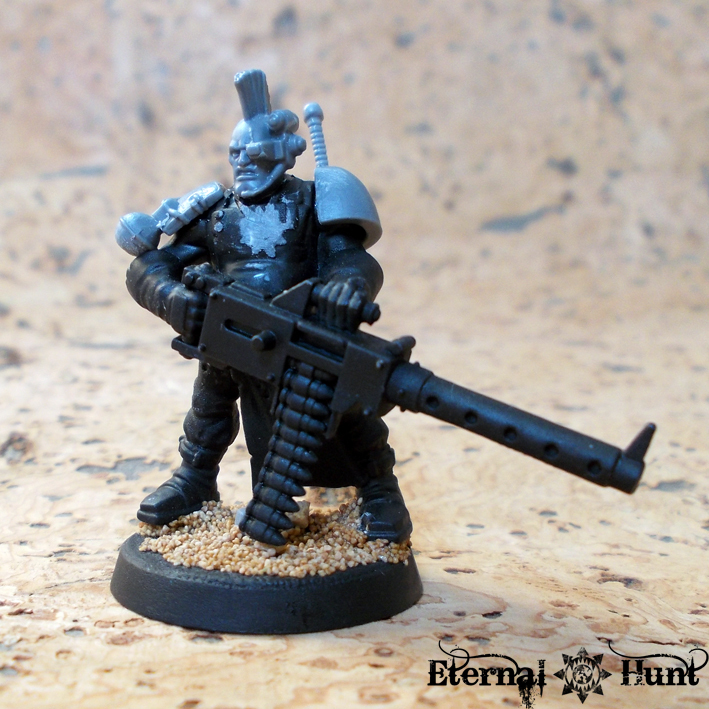 You’ll probably agree that this guy will need quite a bit more work: I love the pistol and overall pose, but the head is clearly too big. And while I like the thought of giving him a tie or cravat of some kind, it was pointed out to me by fellow forumites over at the Ammobunker that the one in the picture above makes him look like a Western character — and we certainly can’t have that! As you’ll probably agree, some of these would lead to wildly different outcomes. 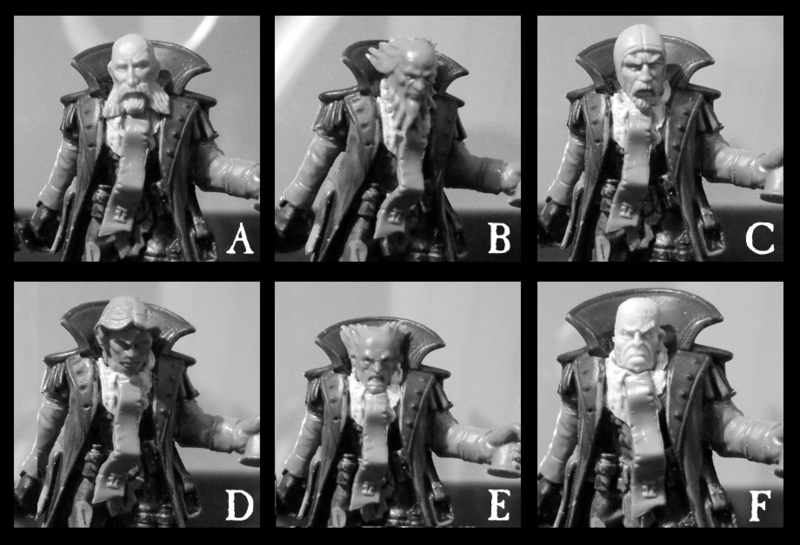 While I am personally rather fond of options A and B for some reason, I haven’t decided yet, so you are very welcome to put in your own two cents on the matter! 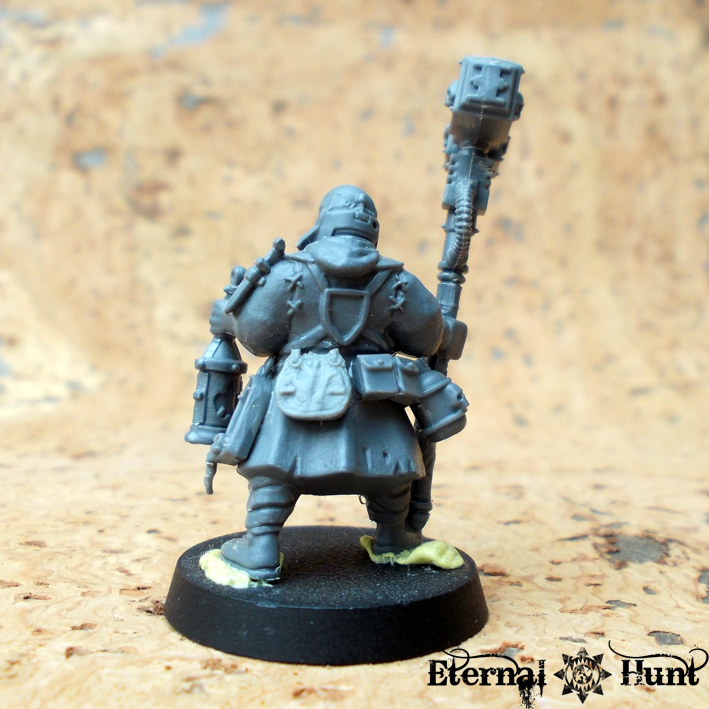 I had always suspected that the heavy weapon cultists would make great base models for IG veterans, and indeed, all it took was a couple of bitz! 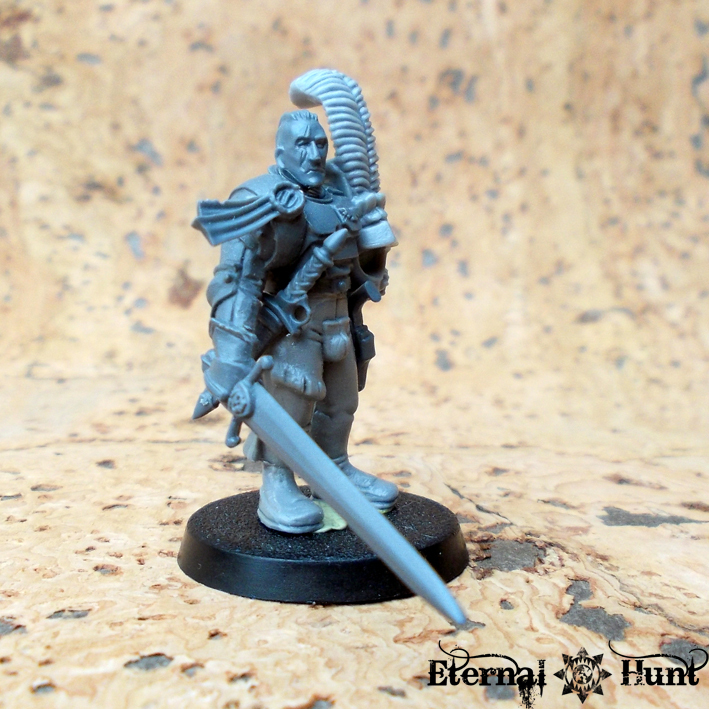 The Space Wolves scout head gives the model some punk attitude, so this guy could conceivably have been a ganger before being drafted into the guard. Well, you know what they say: Evil never sleeps. So it was clear I also needed to build some more villains. 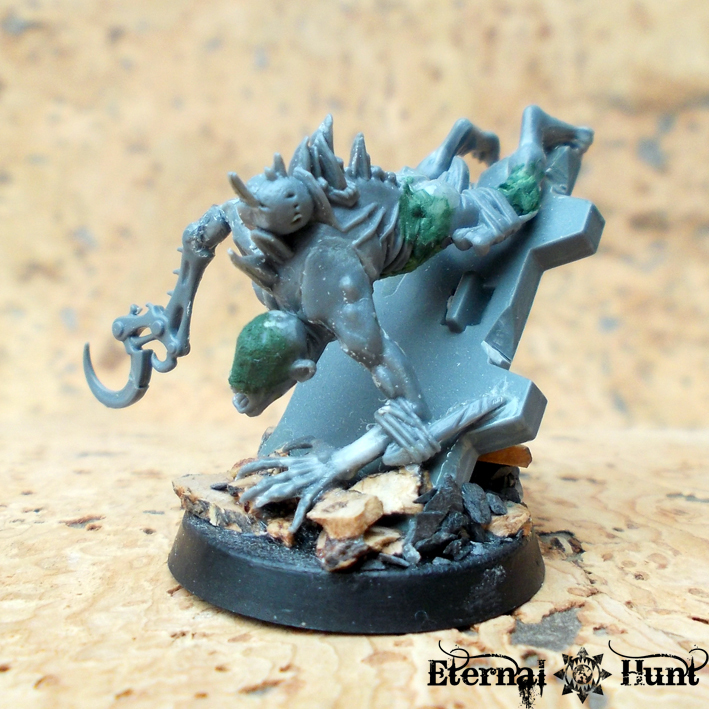 Quite a long time ago, I built some crawler troglodytes to serve as the genetically enhanced brood of one rogue Genetor Amnon Helix, a recurring nemesis to Inquisitor Antrecht. The models were posted ages ago on Molotov’s blog. 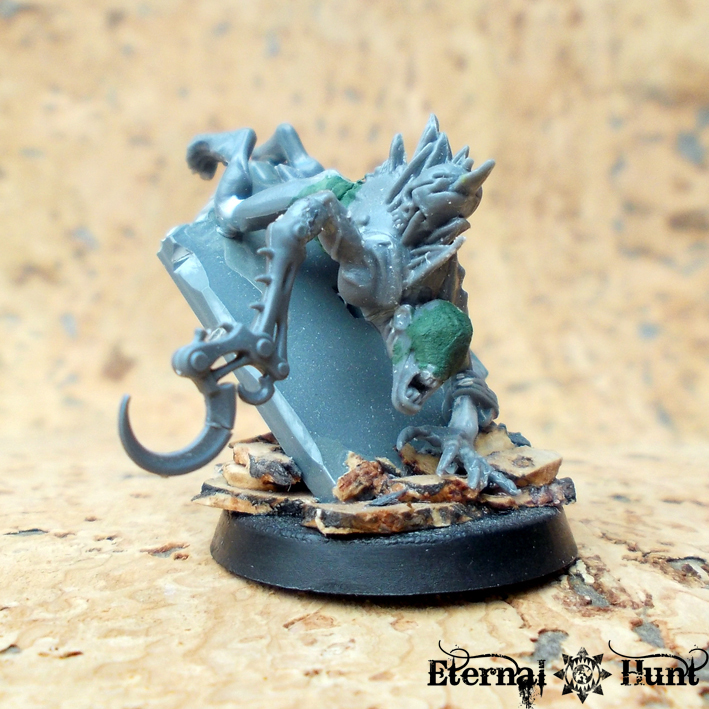 Now I didn’t do a whole lot with these for some time, but when the new model for chaos champion Vilitch the Curseling was released, I started wondering whether those crawlers wouldn’t be even more disturbing with a near featureless face, not unlike Vilitch’s. The original model used a regular WFB Crypt Ghoul head, and now I shaved off the model’s eyes and nose and smoothed out the whole are with Liquid GS, opting for a horrible, mostly featureless face. This makes the creature look quite a bit more revolting (and far less like Gollum, which is also a plus). 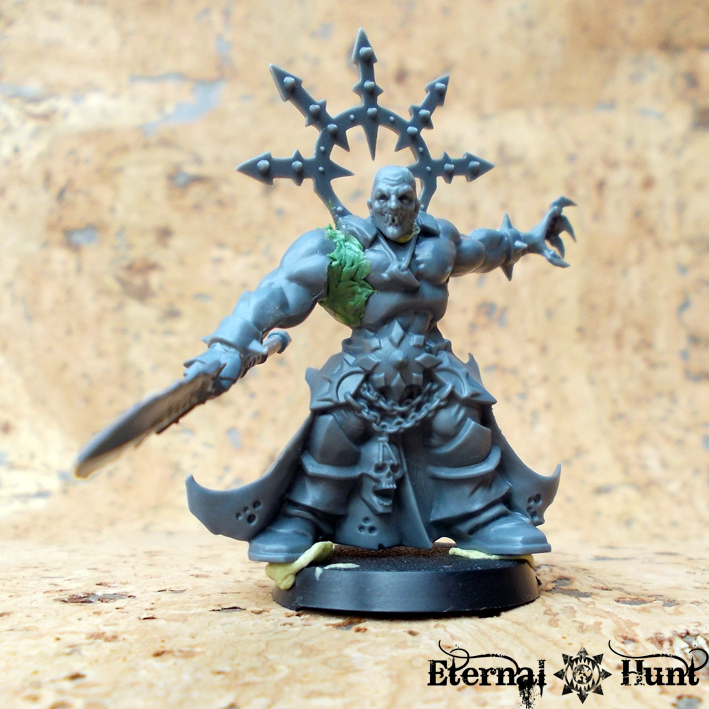 All in all, I think the model makes for a quite convincing champion of Slaanesh, and he would also work as a cult leader in games of INQ28. In any case, C&C are always welcome! And, as always, thanks for looking and stay tuned for more! But what was I up against? I couldn’t begin to tell you how much I love this model! Biohazard is a true master of kitbashing huge chaos war machines, and his Bloodstalker is a testament to that: Kitbashed from many disparate parts into something that looks almost like a regular GW kit, this beast ranks among the best Defiler conversions I have ever seen and would also certainly be a fierce opponent. 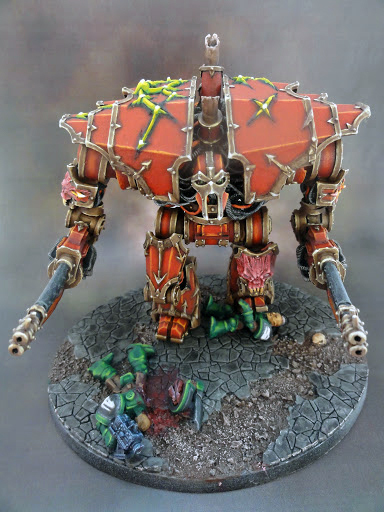 A masterfully painted Forgeworld Decimator. 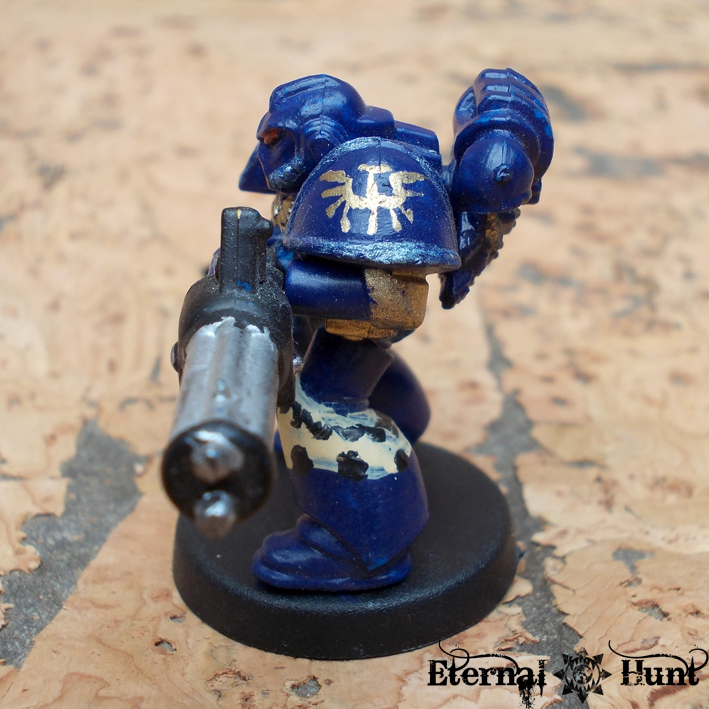 The model itself is lovely, and the smooth blending technique on this piece managed to blow both my and Biohazard’s paintjobs clean out of the water. Fantastic work! What I especially liked about the three entries was how different they were from one another. 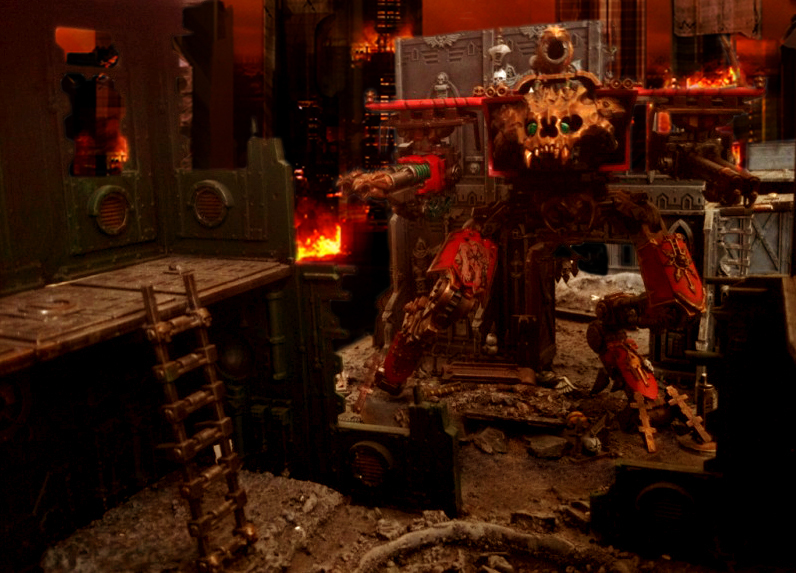 And still, each of them represented an imposing daemonic contraption, bound to the will of Khorne. So how did it all end? Well, I didn’t win this time. But I didn’t mind, since losing to either of these models certainly was no shameful affair. In fact, I was actually really happy when Biohazard’s Bloodstalker won the competition! A well deserved victory! Great job, buddy! All in all, what a great result: The contest produced three great entries. My favourite managed to win. 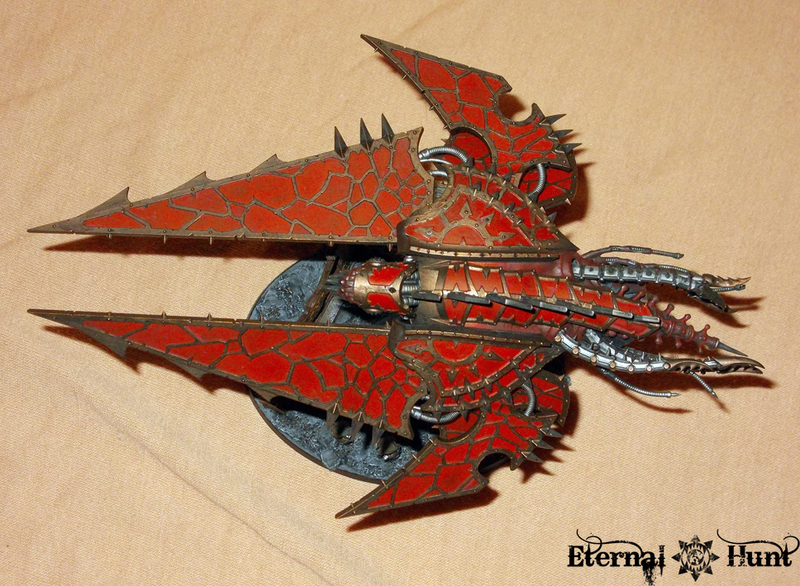 And I even ended up with a converted and fully painted chaos flyer for my army. Plus I am really thrilled to see what kind of motto Biohazard will come up with for the next contest! 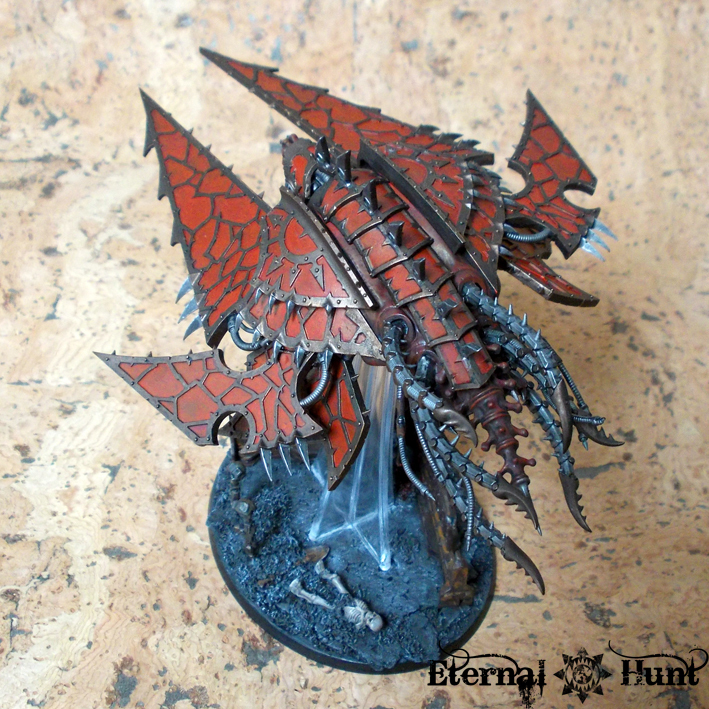 Oh, one more thing: If you want to own your very own Bloodstalker pattern defiler, you are in luck! Biohazard has you covered: He was actually nice enough to write up a tutorial on how to build this beauty. 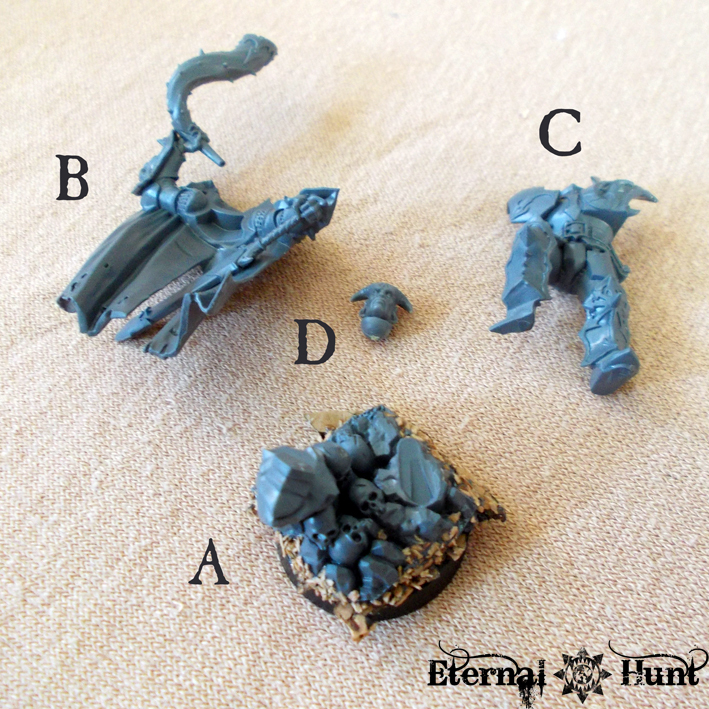 It also explains which bitz you are going to need. Check it out here. With all the base colours in place, the next step was to apply the washes: Most of the model was generously washed with GW Agrax Earthshade to add some shadows to the red and bronze parts. 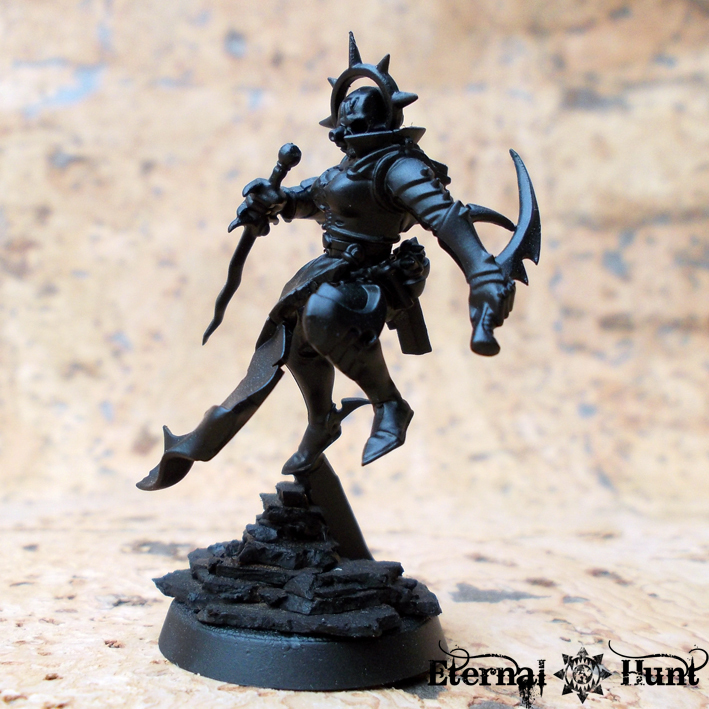 The silver areas received the same treatment, only with GW Nuln Oil. After everything was well and dry, I drybrushed the Bronze with GW Dwarf Bronze, added a thin layer of GW Blood Red for the red parts and finally did some accents on the silver areas with GW Mithril Silver. An opening was cut into the cork to leave a space for the flight stand to be inserted. With both the model and base painted, I did a couple of final adjustments: The final set of wings could finally be added, changing the model’s silhouette quite a bit. But see for yourself. I give you: The Hellrazor. 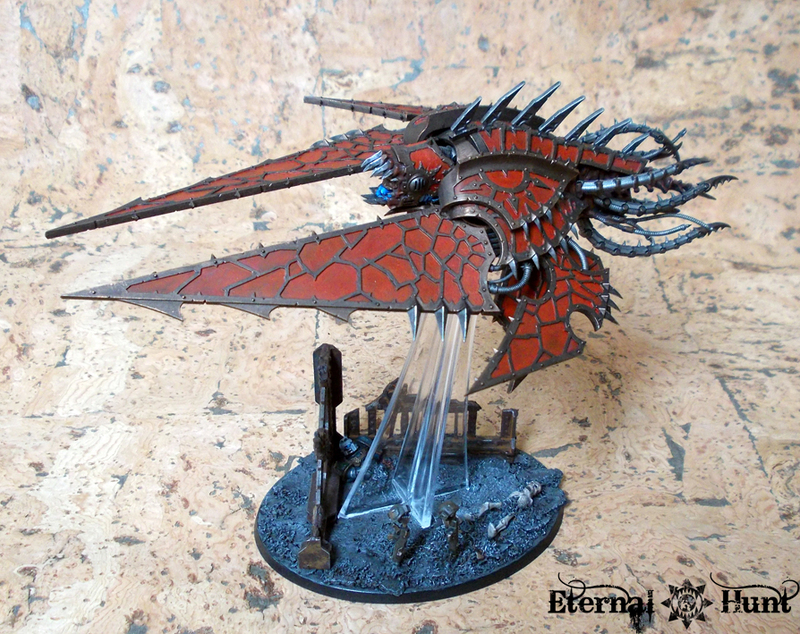 All in all, I am prepared to call this project a success: Granted, this beast was a chore to paint, but I think that I’ve managed to convert a flyer that looks decidedly different from the original Heldrake will still maintaining a visual balance between jetfighter and strangely organic daemon engine. 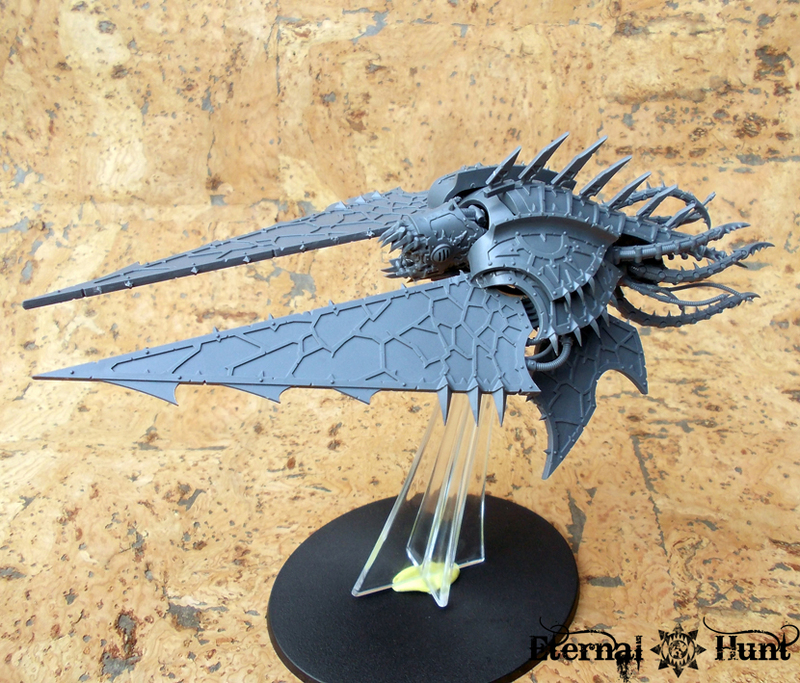 And the model also looks pretty similar in silhouette to the Forgeworld flyers — hence the name “Hellrazor”, to show a certain kinship to the Hell Blade and Hell Talon, in case you’re still wondering (there’s also another, even more obvious pun hidden in there, but I’m confident you’ll figure it out on your own 😉 ). The cavernous hall was illuminated by the flickering half light of the grand furnace. Lorimar’s eyes needed a moment to adjust. 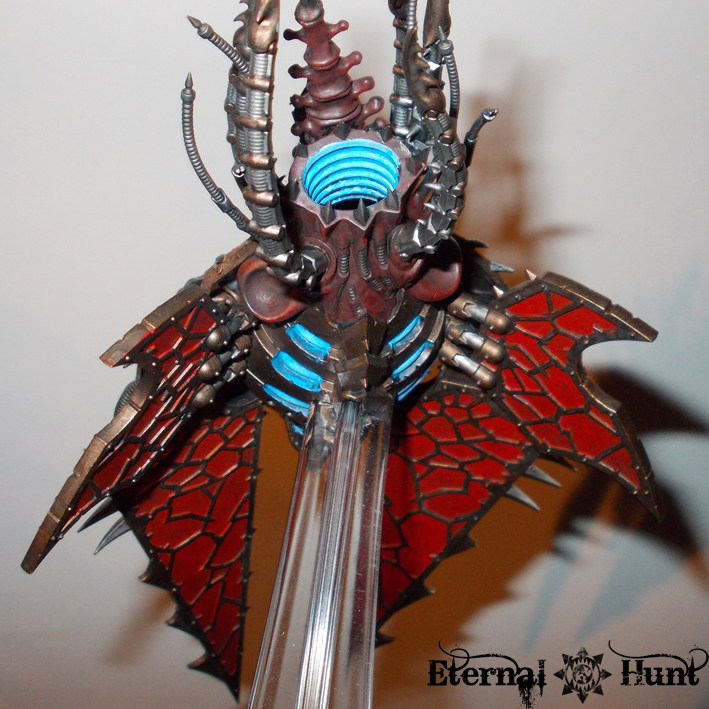 Then he could see Deracin standing in front of the huge daemon engine, gazing up at its form. Lorimar approached the Keeper of the Forge. “I salute you, hunter. You requested my presence?” Deracin turned to face him and inclined his head. “Yes, lord.” But he did not say anything more. “Is this about the daemon engine, then?” Lorimar growled. Deracin nodded ponderously. “Aye. As you can see, the vessel itself has been completed.” He gestured towards the shape of the war machine. 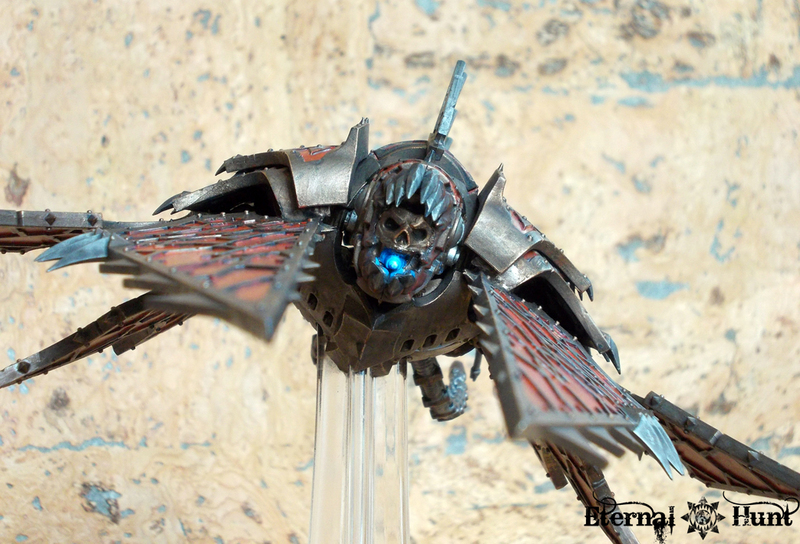 Lorimar could see the pointed wings and jagged armour plates, he could see where fleshmetal had grown to fuse with the machine’s structure. 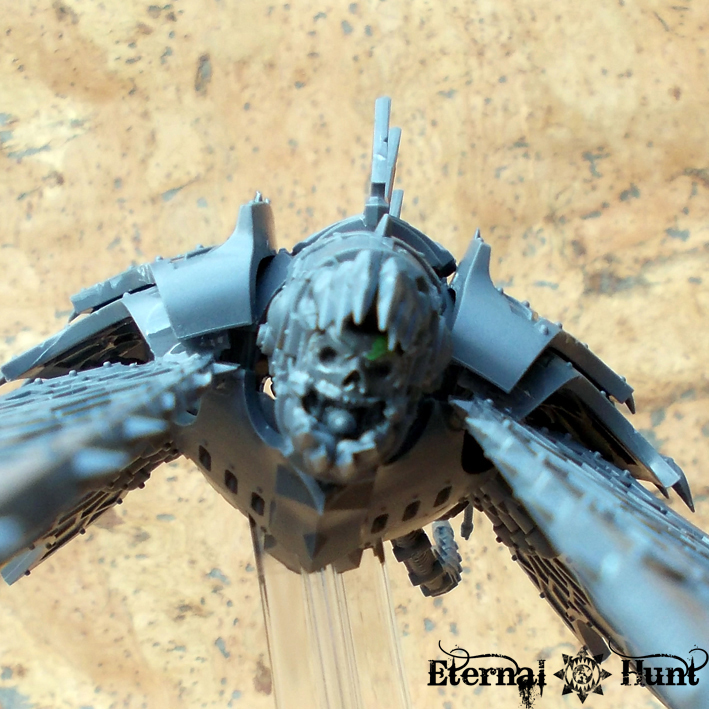 Suspended above them was the daemon engine’s head, a grinning brass skull. The rest remained half hidden by the shadows, although Lorimar got a sense of the strangely organic shape of the thing. “And the incantations?” he growled. Deracin seemed to grow uneasy. “My lord, it would be best not to refer to him as that any longer. We cannot be sure of what remains after the rituals. And truth be told, there was not much left even before that…” His voice trailed off. They could both feel it. A strange feeling of otherness. And then a sound, low and guttural at first, but still unmistakeable: the sound of a huge animal drawing breath. Whatever the daemon engine suspended in darkness above them may have housed. It lived. Sondheim used his field glasses to look towards the front lines, where the chaos forces were advancing towards the Imperial position. He could make out the red armoured shapes of their enemies, and he couldn’t suppress a sinking feeling. 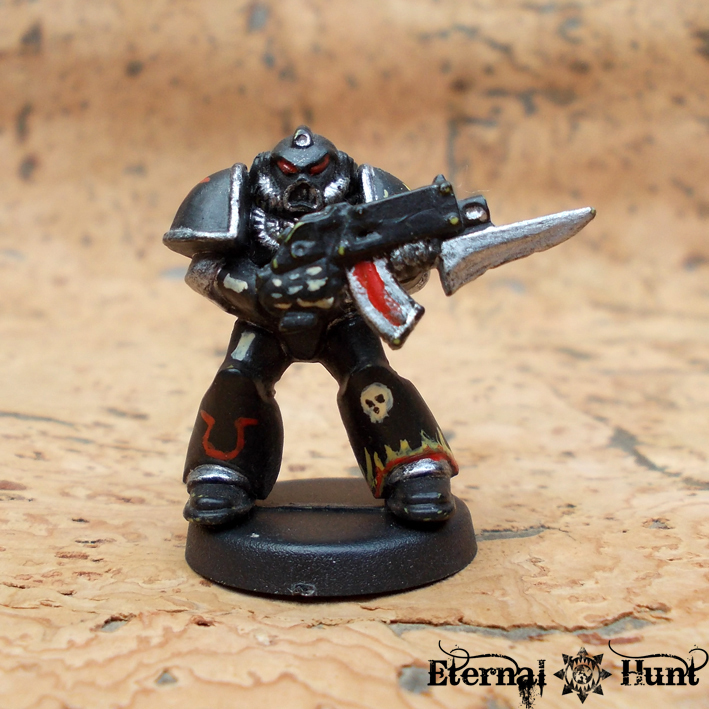 The traitor legionaries of the World Eaters were deadly in combat, and to let them reach their lines would mean disaster. 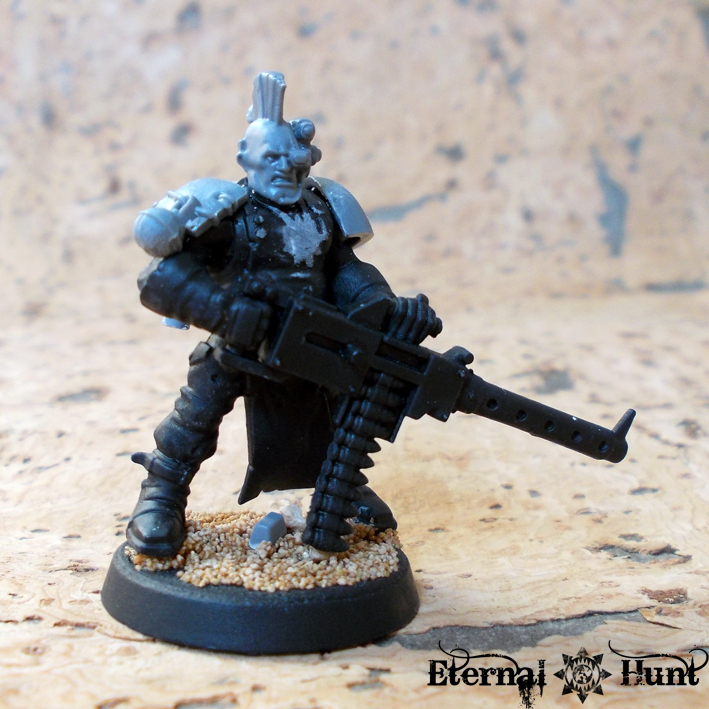 However, the Guard’s superior firepower had so far proven successful in stalling the enemies’ advance, pinning the abhorrent traitor Astartes and preventing them from rushing the Imperial positions. Sondheim turned to his aide-de-camp, Junior Commissar Kelso: “Armin, send word to the Lord General that we have matters under control here. As long as our ammunitions supply lasts, we should be able to hold them back indefinitely. The Emperor’s justice will be meted out to these vile abominations.” Telzo nodded and opened his mouth to reply, when both men suddenly heard something above the din of battle: A rolling thunder that was steadily growing louder and louder. “Air support. They have air support!”, Kelso said, his eyes frantically searching the horizon. “Don’t worry, lad!” Sondheim answered. “Just one of those light jetfighters. Our anti-aircraft guns will swat it down like a bothersome fly.” He took a look through his field glasses, and sure enough, there was the shape of a chaos flyer approaching, its shape like a jagged blade. There was something slightly warped about its silhouette, though. Sondheim grinned to himself: It was no use trying to keep track of all the different kinds of corruption that chaos wrought upon both its followers and their wargear. But Throne, that thing was fast! Sondheim could hardly keep it in focus. And the closer it came, the more he felt a certain apprehension. He could see the thing now, shaped like a two-pronged dagger, yet strangely sinuous and organic at the same time, weaving between the bursts of AA-fire that were supposed to take it out. The noise was also getting louder: a strange animal roar, and above it, something else, like the sound of a thousand voices screaming in unison. “What in the name of Terra…?”, he murmured. “My lord,” Kelso’s voice sounded worried, “shouldn’t we abandon this position? It’s coming straight at us!” Sondheim heard his words, but he found himself strangely transfixed, staring at the approaching horror, listening to the rumble of its engines. He could make out details now: The wickedly sharp wings, something that looked like a head, wrought in the shape of a stylised skull, its mouth seemingly weeping blue flame. “Retreat!” he heard Kelso scream above the horrible noise, “Abandon this position!” And it was at this exact moment that Lord Commissar Sondheim knew fear. And then his world turned into fire. And with that, my Hellrazor was completed. Any comments or questions about the model? I’s be happy to hear from you in the comments section! Next time, we’ll take a look at the other entries my model was up against. I have to be honest with you: In this particular question, I feel rather drawn towards the haters’ camp: While I love the idea of a chaos flyer slowly mutating and changing to a quasi-living being, with its erstwhile pilot having atrophied to a husk serving as the beast’s black heart, and while the latest FAQ pretty much transformed the Heldrake from a very viable option into an “auto-include”, I am still not sold on the kit itself. 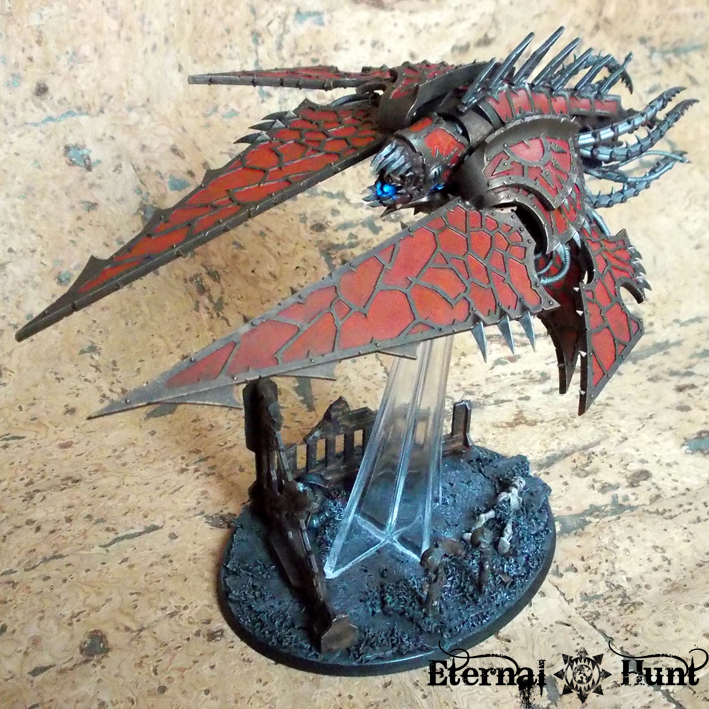 Make no mistake, the beast has grown on me a little, and I don’t hate it as much as I did last October, but it was immediately clear to me that any Heldrake included in my World Eaters army would have to look pretty different. 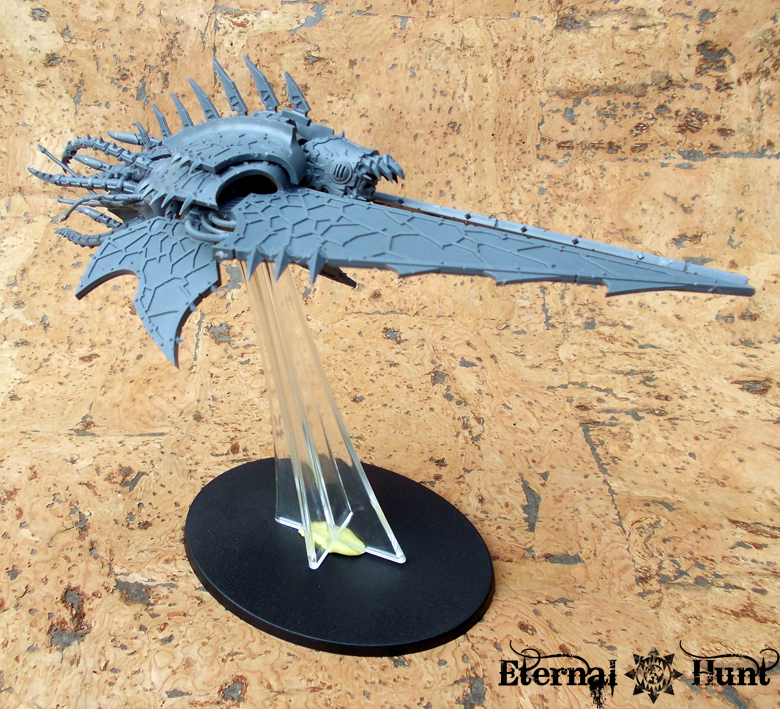 This mini-series, then, will deal with my own Heldrake conversion slowly taking shape. 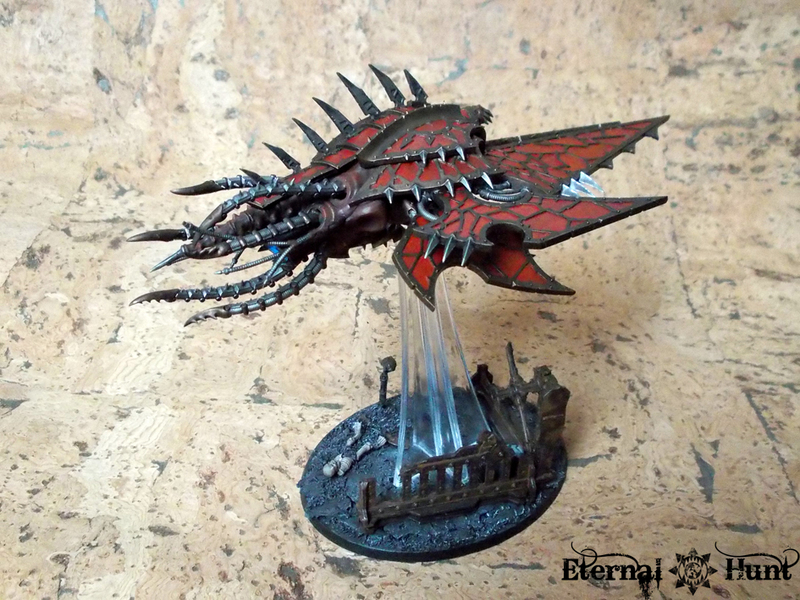 As luck would have it, I had won a Painting/Converting Contest over at Throne of Skulls some time ago, and so I was allowed to choose the motto for the next contest — what better occasion than this to force myself to actually convert and paint a chaos flyer of my own? 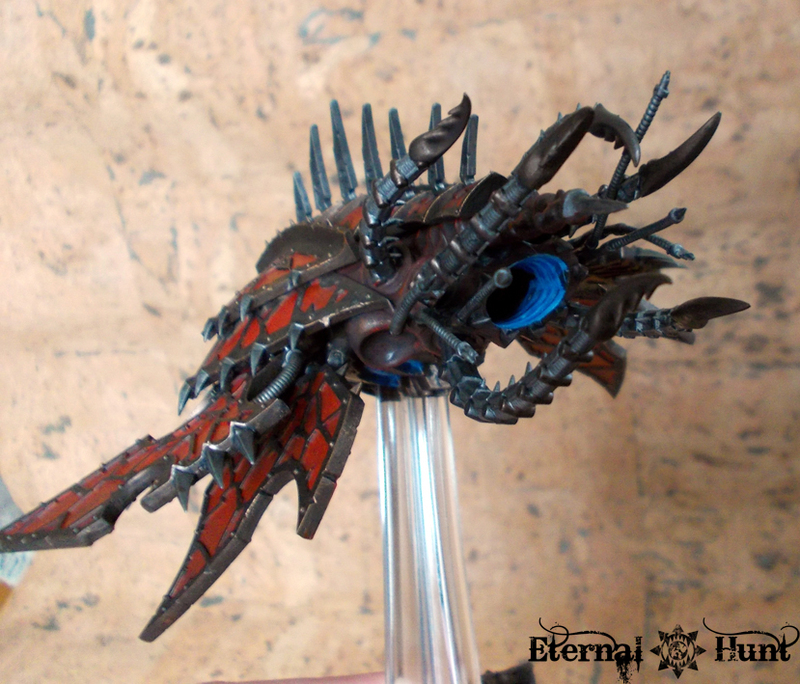 So I decreed that the contest would deal with Khornate Daemon Engines, in order to both let myself be inspired by other peoples’ awesome creations and to put myself under a bit of pressure regarding my own entry. 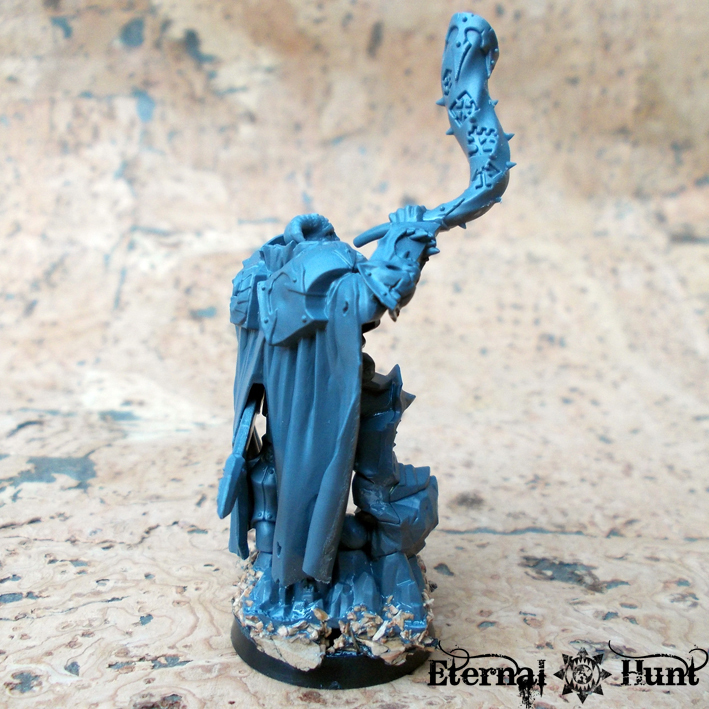 My inspiration for this conversion came from Marshalfaust’s thread on Warseer. 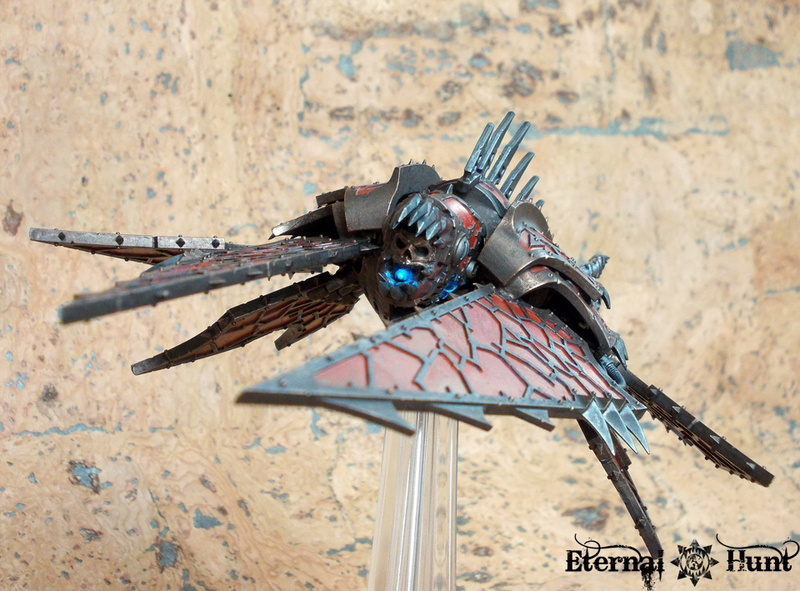 Honourable mentions must also go to Morf’s exquisite “Hellbat” and Old School Terminator’s scratchbuilt Nurglite Heldrake (or his “Hellworm”: that …thing is truly something else) — those would be my conversions of choice if I wanted to build Night Lords or Death Guard flyers, respectively. As you can see, only the longest set of front wings was used. 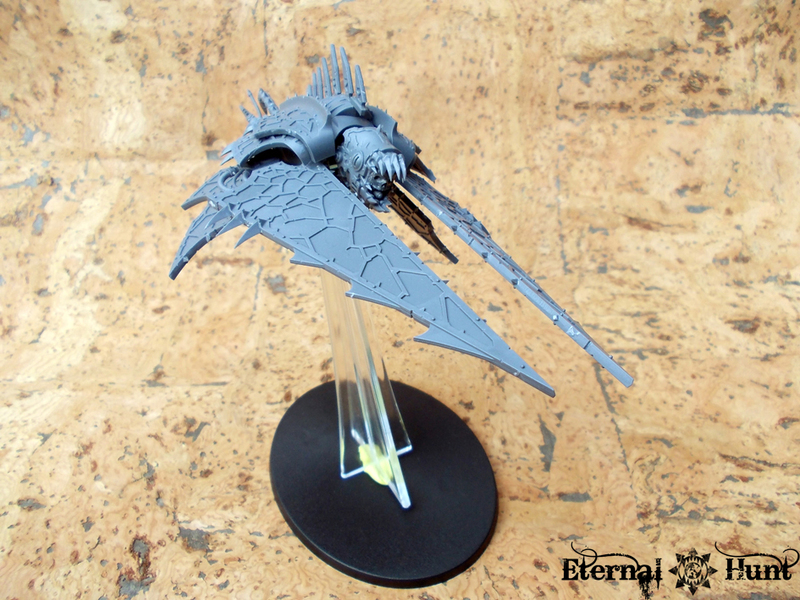 I attached it directly to the main body, leading to a look slightly reminiscent of the different FW chaos flyers. 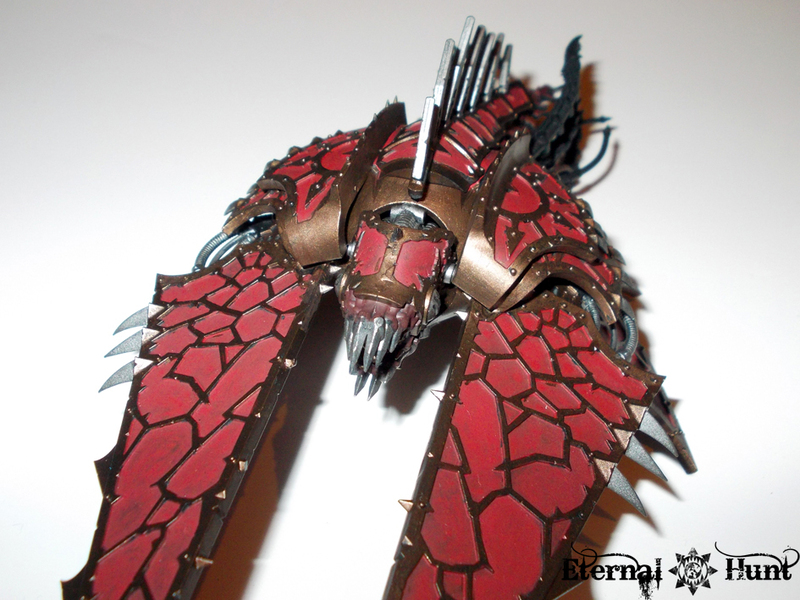 One smaller set of wings was added in the regular position. 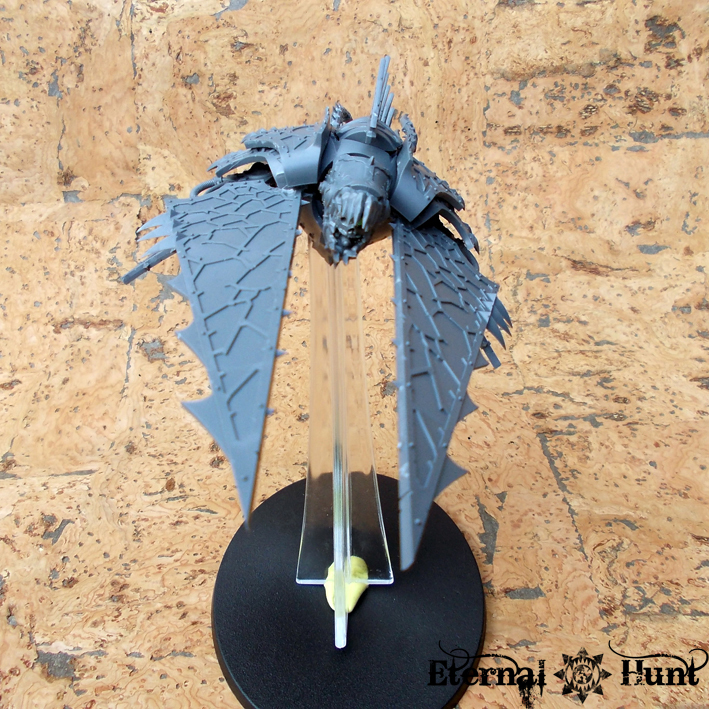 While I wanted to add yet another set of wings towards the back in order to give further definition to the model’s shape, that would obviously have to wait until everything was painted (looking back now, that turned out to be a very smart decision…). 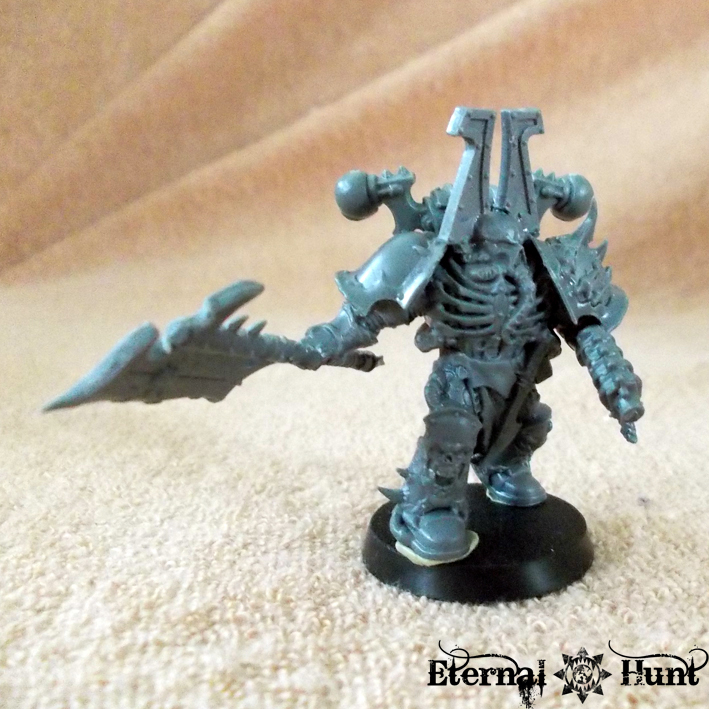 The neck was also left out, and the head replaced with an optional leftover head from the Forgefiend kit. 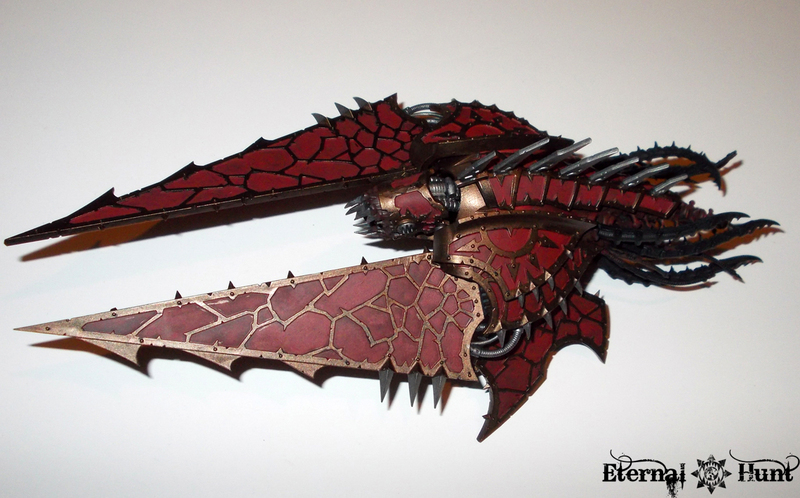 With the lost arms and claws on my Heldrake, I also like to think that these tentacles are used as a CC weapon of sorts, slashing and whipping at other flyers and enemies on the ground. The next step was to start painting this thing, and I will not lie to you: It was a nightmare! 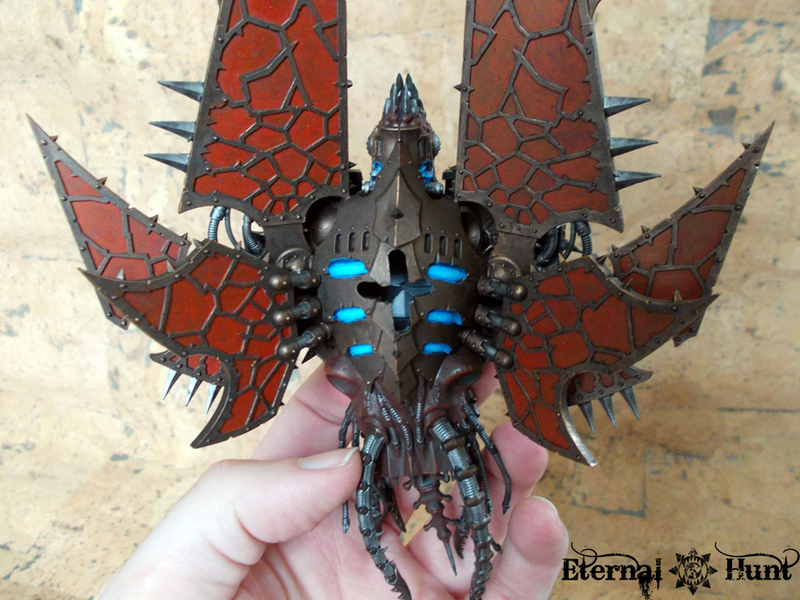 All those small panels on the wings took ages to paint. 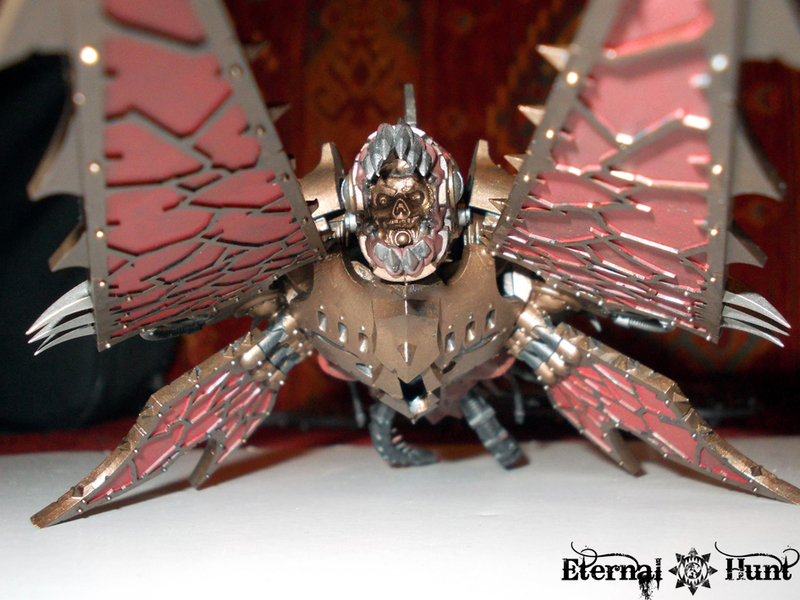 And there were so many of them, even though I hadn’t used all the wings that came with the kit in the first place! Nevertheless, I persevered and used the same base colours appearing throughout all of my army: The red areas were painted using GW Mechrite Red, the Bronze trim was picked out in Vallejo Tinny Tin, and the silver areas were done with GW Boltgun Metal. I decided to paint the slightly fleshy, mutated bits of the model in a dark brown-red instead of a paler skin tone. That way, I would get a pretty organic transition to the reds on the model and would be able to avoid any expansive, pink areas. But that, as they say, is a story for anoter time. So stay tuned for the next installment of Raising Hell, coming this Friday! 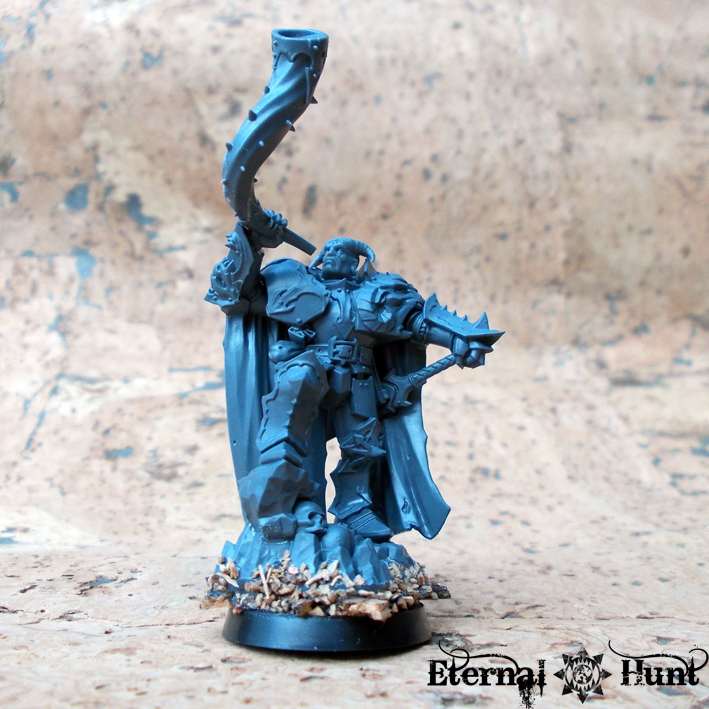 Not only am I a great fan of building characters for my World Eaters army (as evidenced by many, many posts on this blog), I also enjoy having models to represent must – if not all – of the possible selections from the Codex. 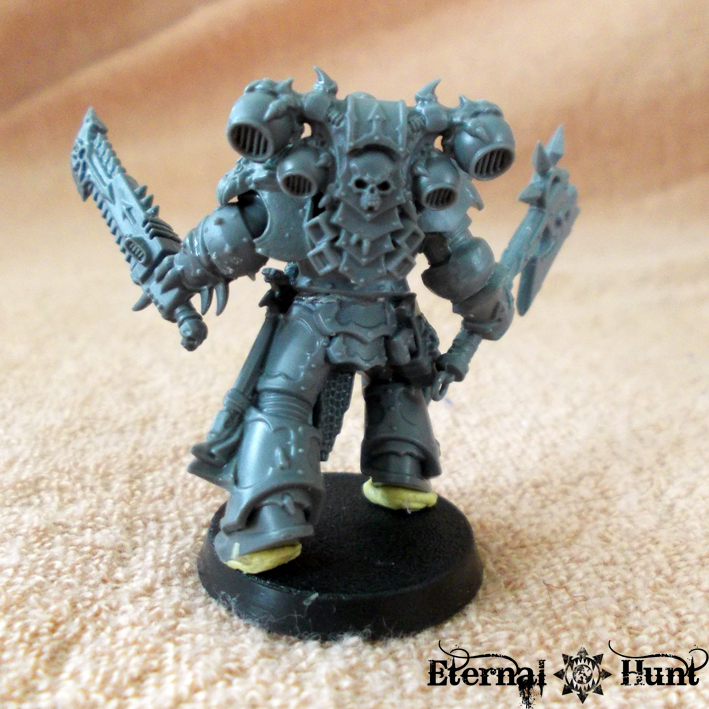 What’s more, I am constantly trying come up with conversions and kitbashes that put a spin on the ideas presented in the book and make the models fit my army’s background: My Chaos Spawn are former World Eaters and still retain some of the gladiatorial feel typical of the legion. My champions and officers are “Huntmasters”, accomplished hunters out to run down their prey. 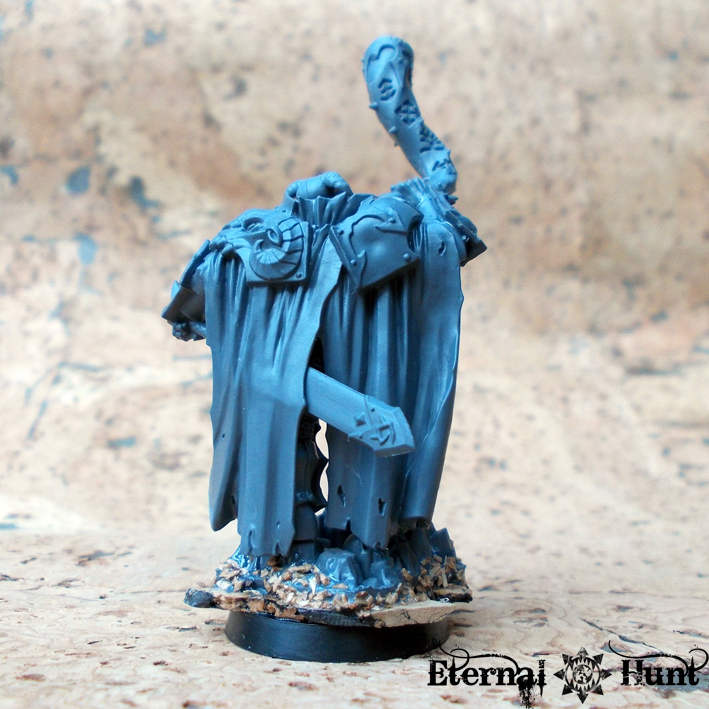 Indeed, most of my army is designed with the hunting background firmly in mind, and for each entry in the codex, I try to come up with a model that is not only clearly recognisable, but also makes sense within the context of the army’s overall look and feel. 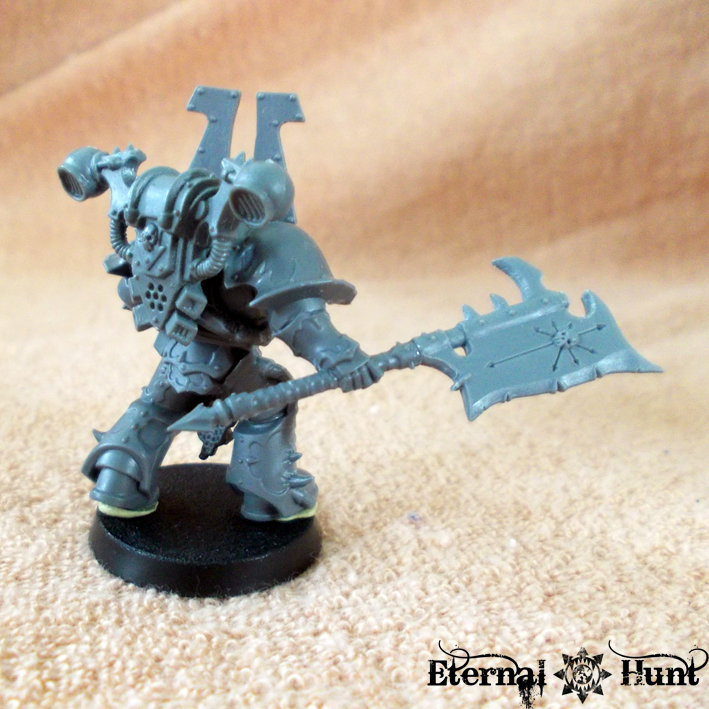 Make the Apostle a Word Bearer that had been assigned to the 4th assault company during the Great Crusade and had been staying with them ever since. 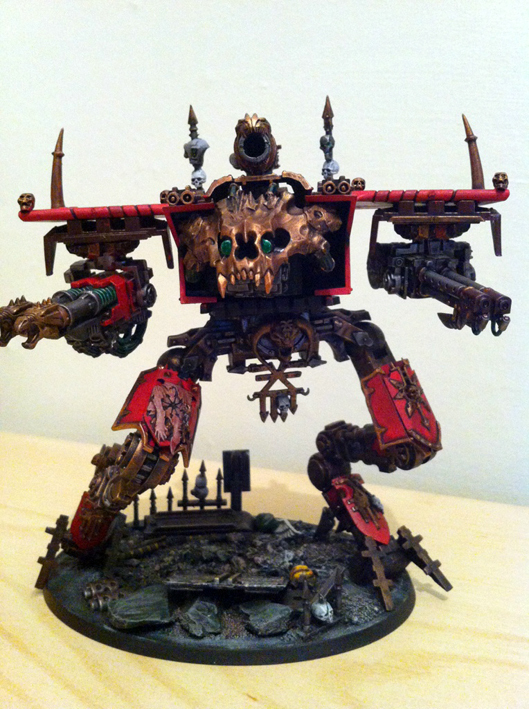 Come up with a way to create a “Khornate” Dark Apostle that made sense within the framework of my army’s background. 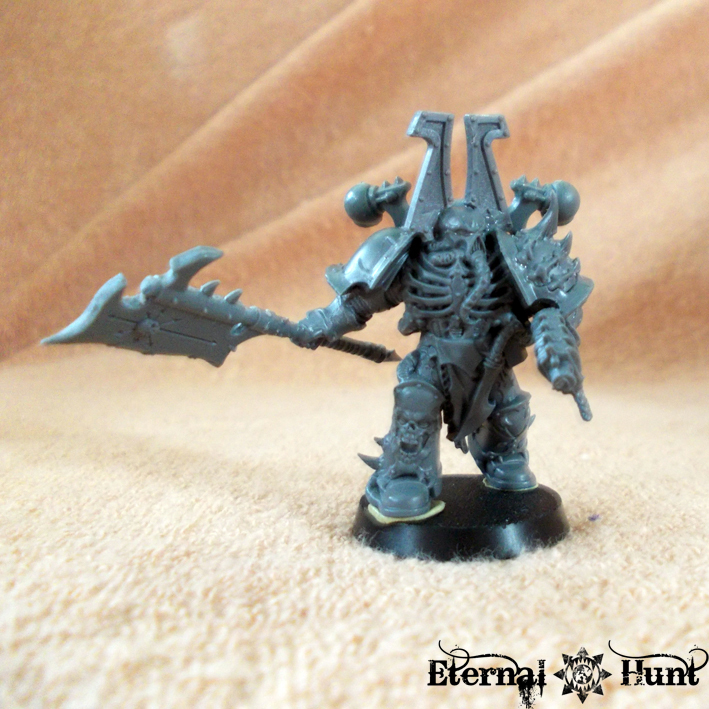 While the first option may be pretty promising from a narrative standpoint, I somehow just wasn’t feeling it: While the Dark Apostle Azalon actually appears in the background of Khorne’s Eternal Hunt and definitely had a hand in their corruption, he’s a character I would maybe like to spin off into a separate army project one of these days. 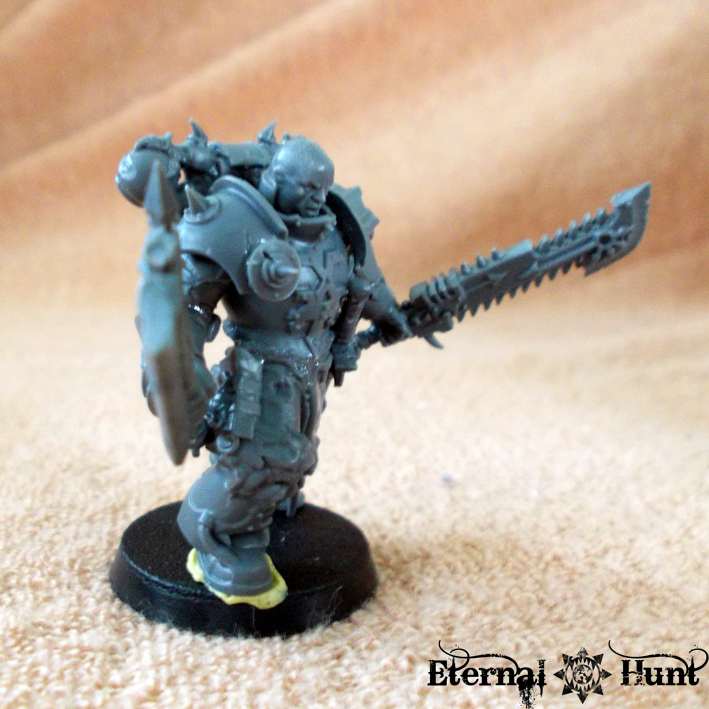 So I thought about making my own apostle as a member of the 4th assault company. 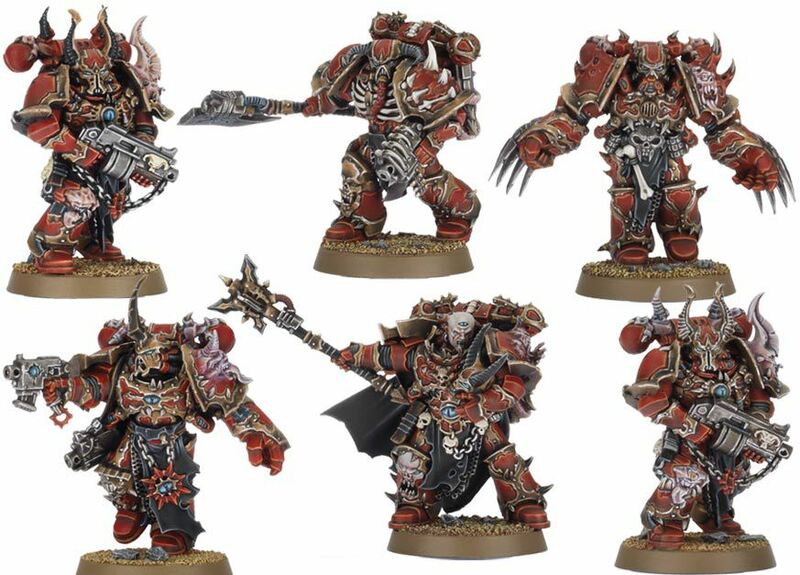 Several Khorne players have come up with some kind of “blood priest”, inciting his brothers to even greater rage during battle. But while that idea was also very cool, it still wasn’t what I was looking for. 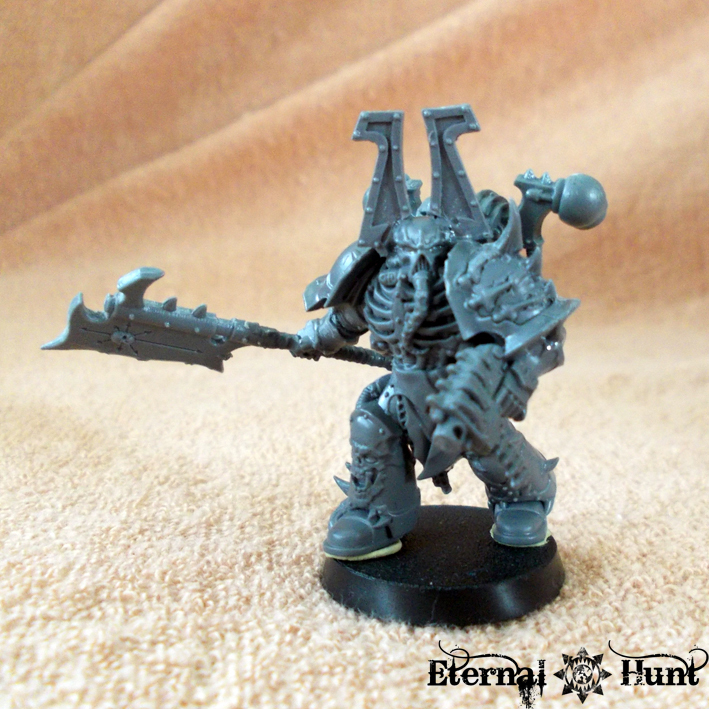 Instead, I thought about what the members of Khorne’s Eternal Hunt would possibly use as a means of bolstering their morale and drive them forward. 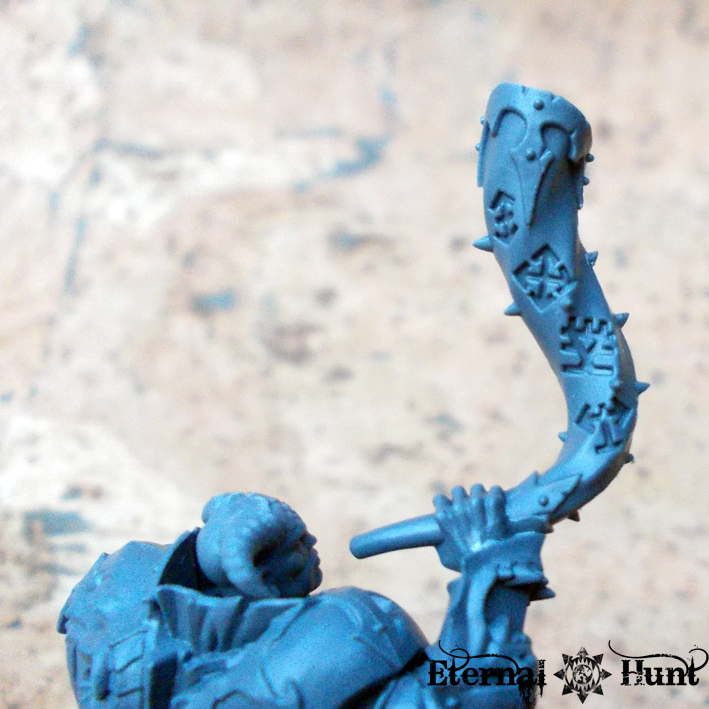 And since it’s a hunting party we are talking about here, the answer was rather simple: a horn. 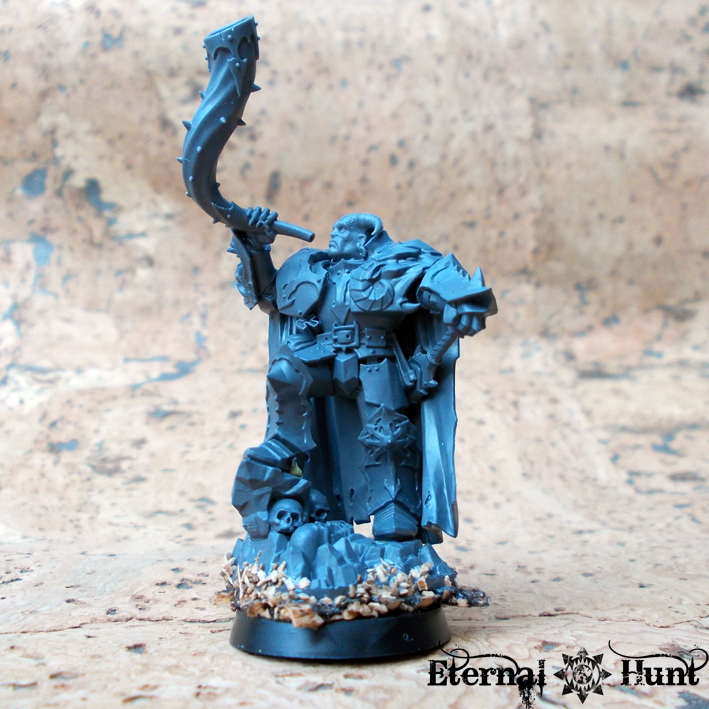 My Dark Apostle would be a hornblower, wielding an ancient and treasured artifact to call the warriors of the 4th to arms and order them forward. 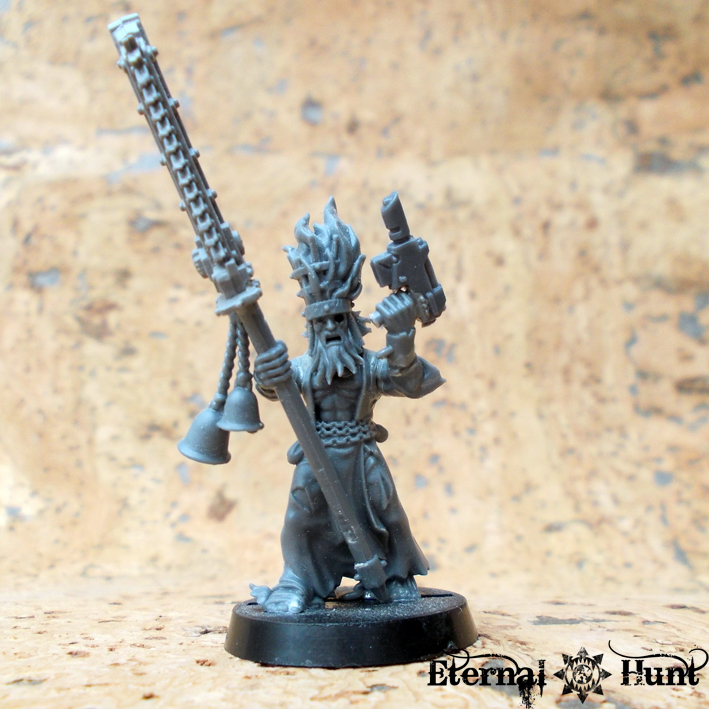 To my mind, it makes a lot of sense that the sound of their most revered warhorn should serve as a surge of motivation to the legionaries of the 4th! So far so good! 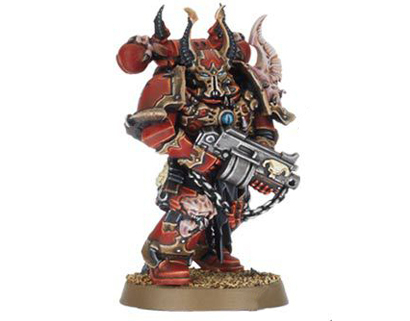 Now when it came to actually building the model, everything boiled down to a lucky coincidence, as is so often the case: When I swung by the FLGS the other day after a particularly horrible day at work, I couldn’t help but treat myself to one of GW’s brand new plastic Chaos Lords. 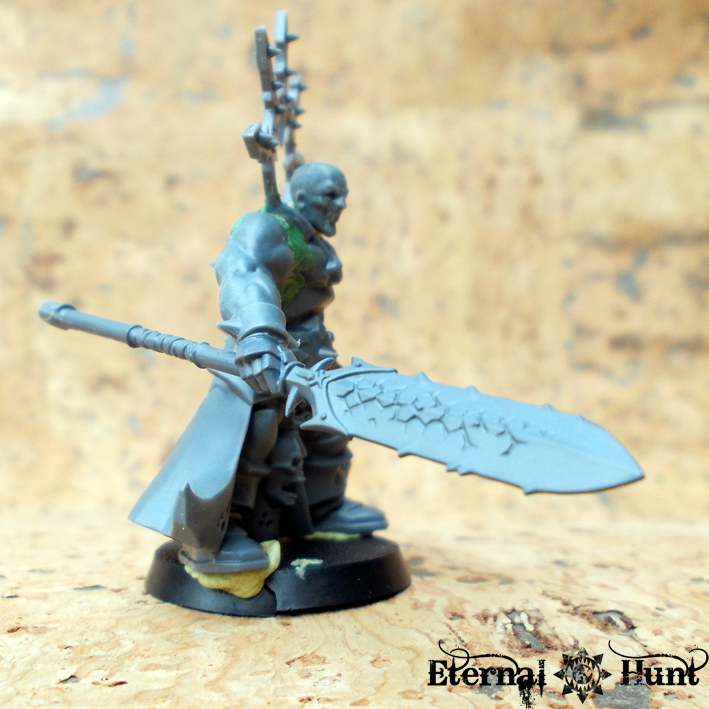 As you can see, it didn’t take much to make the model look quite different: I carefully cut off the hand holding the glaive and used a different head. 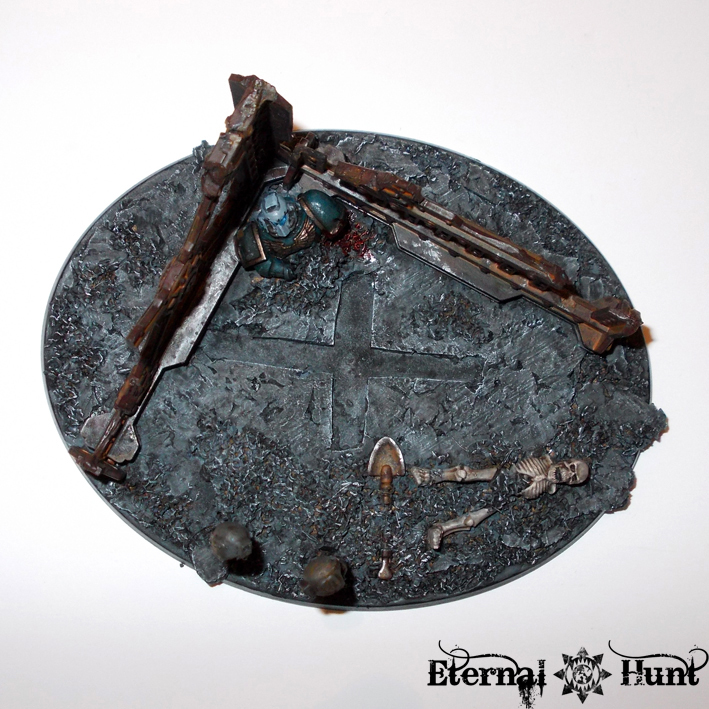 Oh, and I also “converted” the base to fit on a 40k round base. 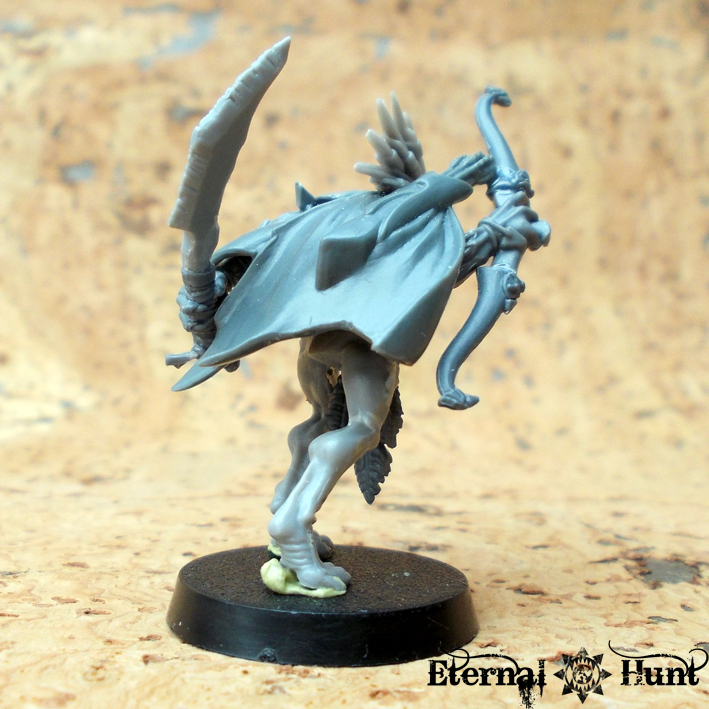 Apart from that, in a move that is fairly atypical for me, the model remains very close to the original design. 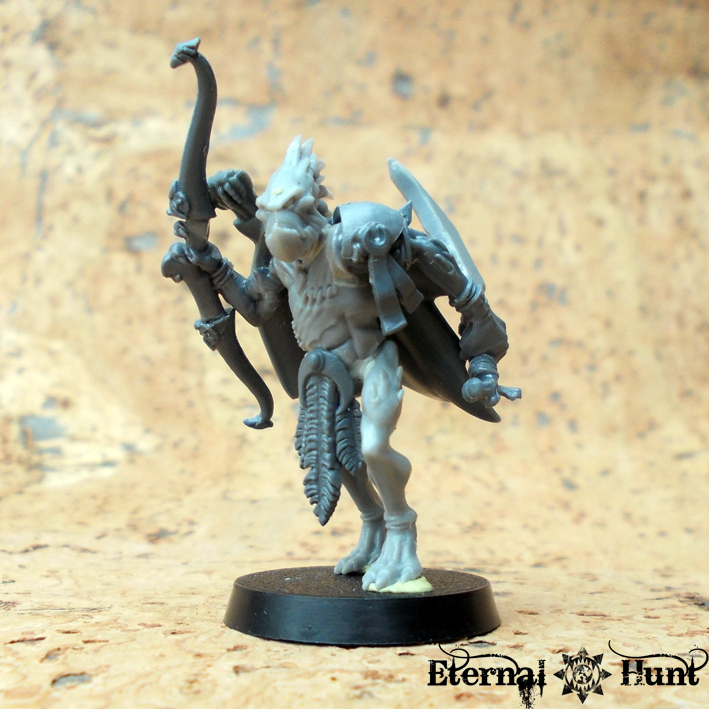 While the head that comes with the model is much nicer than the pictures in WD would have you believe, and while it has a really interesting “Herne the Hunter” vibe going on, it was a little to over the top for the look I wanted to achieve. 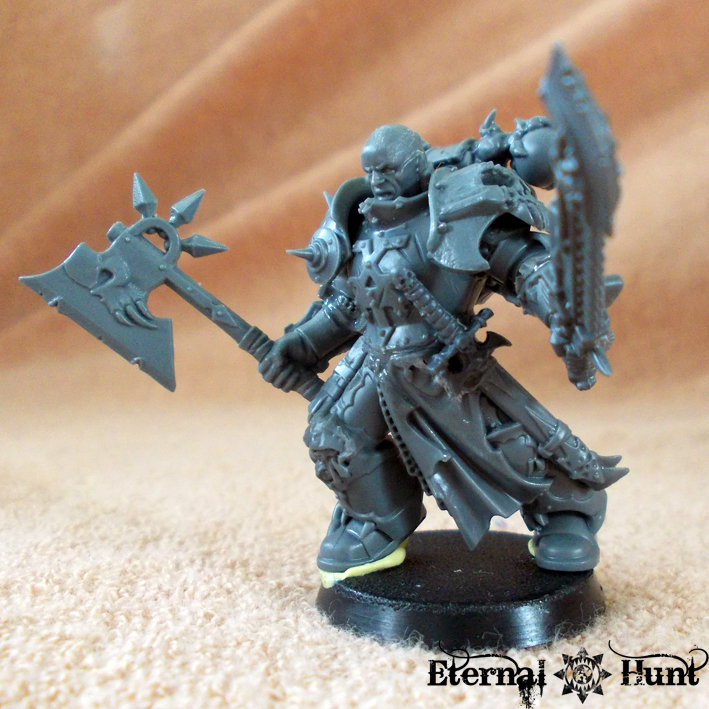 So I used a champion head from the Skullcrusher kit instead. 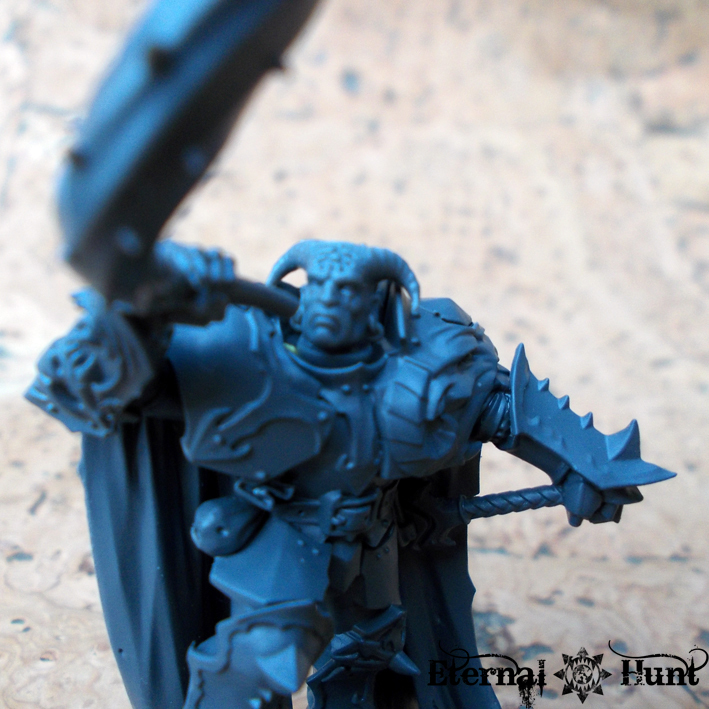 The Khorne rune on the forehead is quite a nice touch, and while I had originally planned to shave off the small set of horns, they somehow really complement the rest of the model rather well, don’t you think? 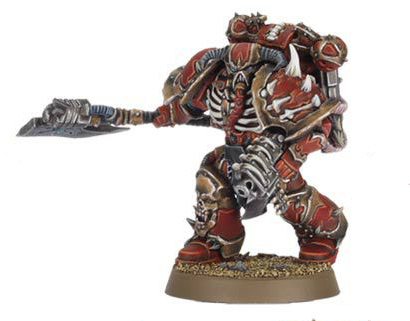 What’s really great about the new Chaos Lord is the depth of the model: He doesn’t look nearly as flat as the plastic models of old. 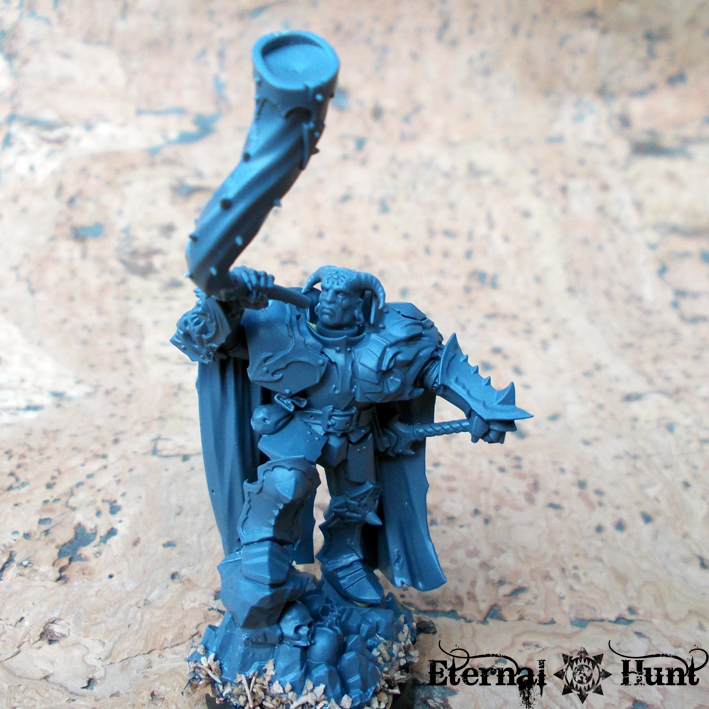 However, this also comes at a price: The parts only fit together in a fairly specific way, so if you want to convert this guy, you should keep that in mind. B: The cape and forearms can be glued together: You can still add or remove the rest of the body (C) afterwards without a hitch. 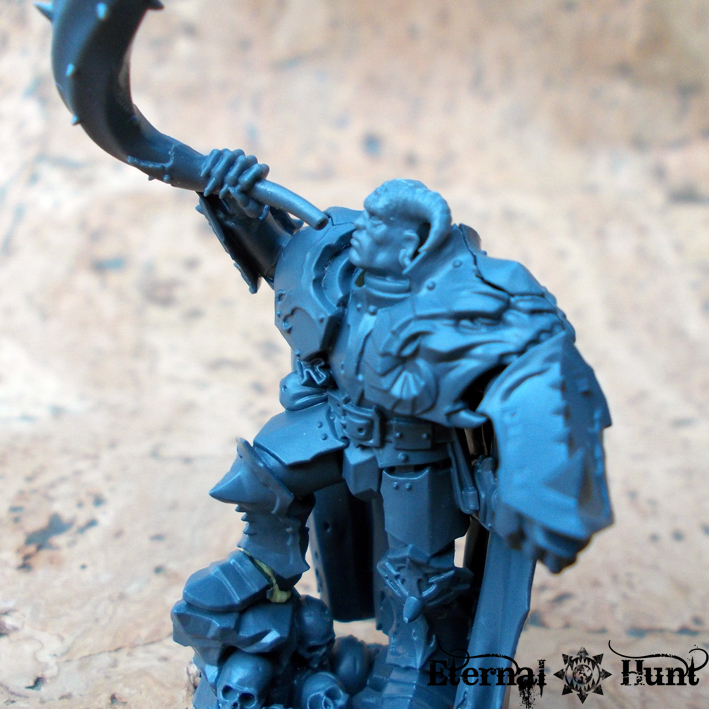 Again, see above for possible difficulties if you keep the glaive in the model’s right hand. 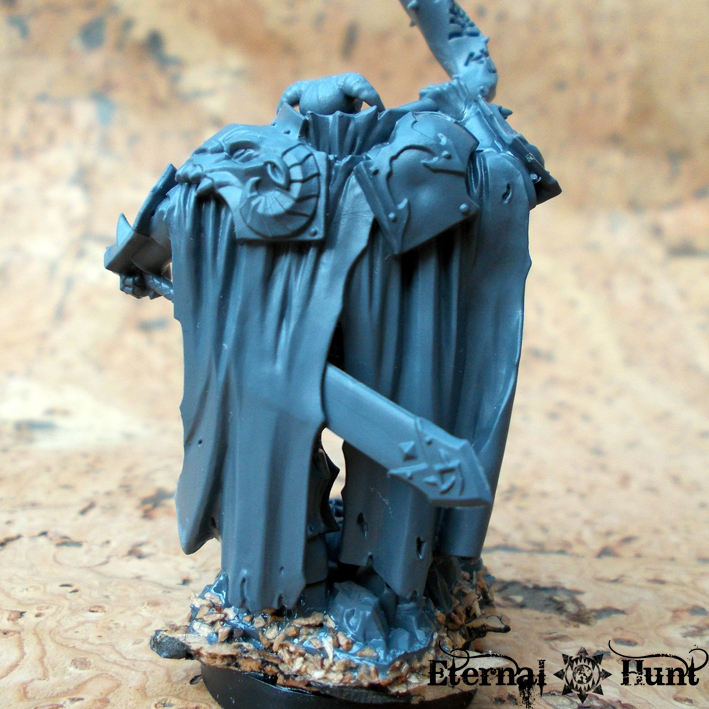 C: The model’s main body and right lower leg can also be glued together. There’s really only one possible position here. Even so, you might want to dryfit this part with sub-assembly A to make sure everything fits together. D: Whatever head you want to use should probably be kept separate until after painting. Oh, and one more thing: This guy is huge! Especially if you use the sculpted base! 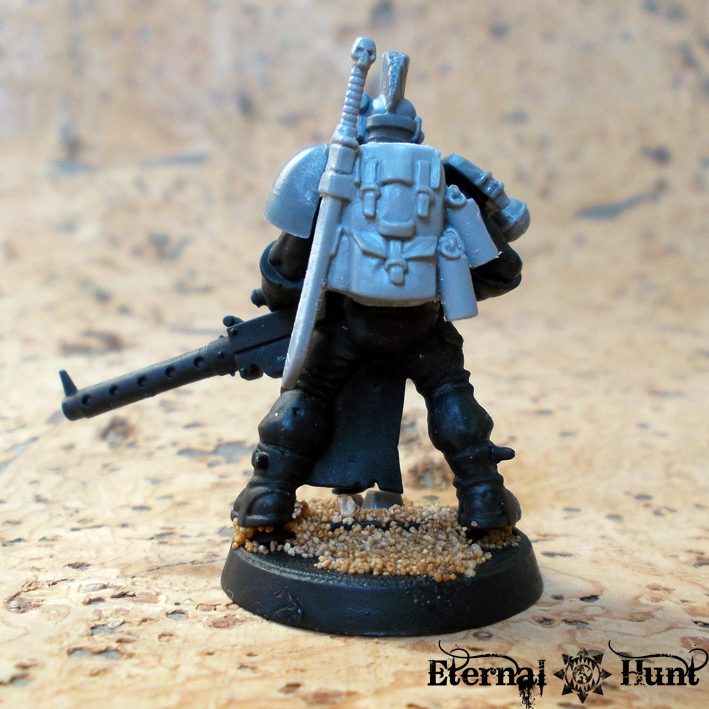 While he is a little less bulky than a Terminator, he almost reaches up to the same height as my Lorimar conversion (base included). All in all, I am really pleased with this guy right now: I may add a small bit or two (and possibly a Dark Vengeance Chosen backpack, to make the model look a little more 40k), but he is pretty gorgeous and quite majestic as he is. 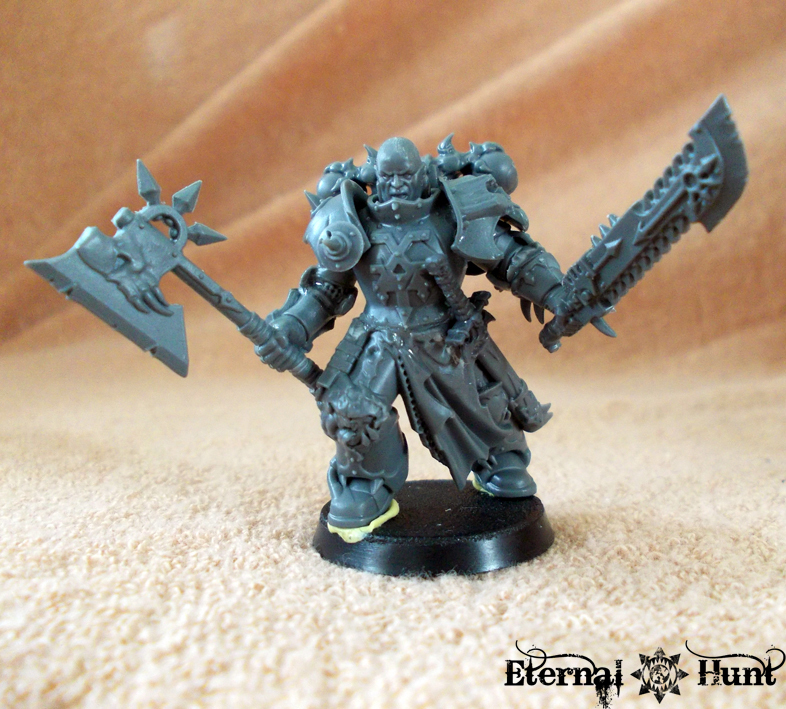 I also think he makes for a rather convincing Dark Apostle in the context of my whole army. 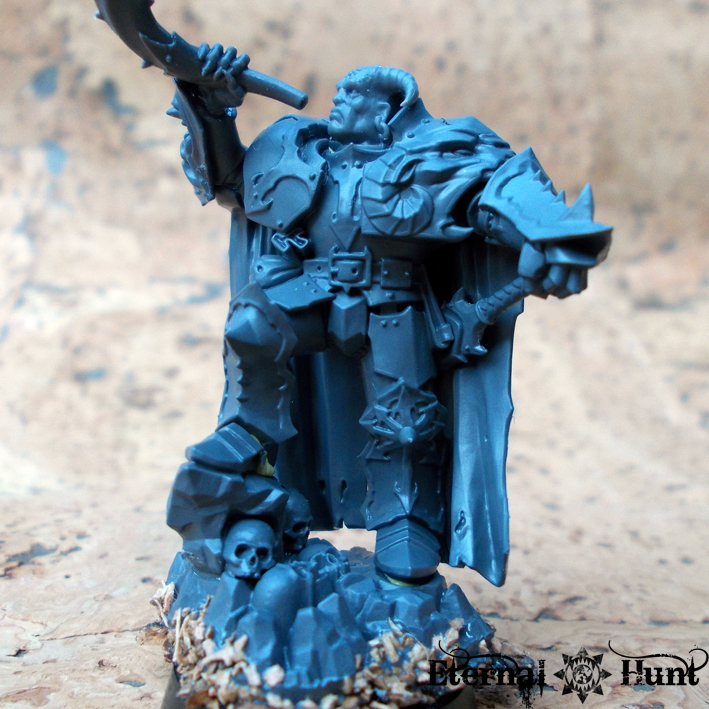 And I can also recommend the WoC plastic Lord, even though the price is nothing to laugh at. Anyway, let me know what you think! And as always, thanks for looking and stay tuned for more!